to be the full story of the early days of WA aerial ag, I wanted to place on record these basic histories and photographs. 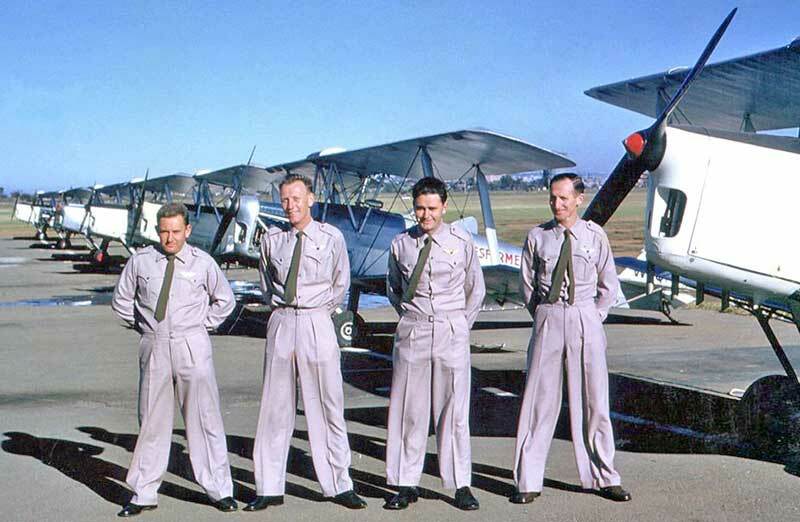 Smartly uniformed pilots of Aero Service Pty Ltd with their Tiger Moths at home base Maylands Aerodrome, Perth in 1960. 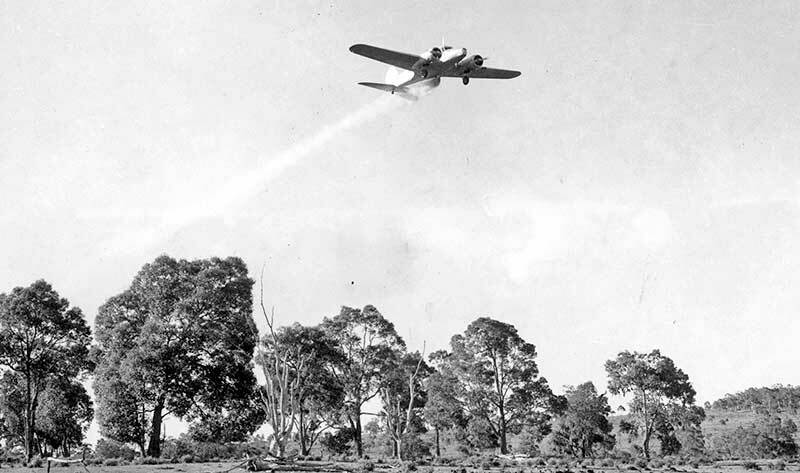 The earliest experimental aerial dropping of fertilizer in West Australia was carried out in 1951 when an Airlines (WA) Ltd Avro Anson was contracted to make trial drops at Perth. Bags of super dust were simply emptied from the open rear cabin doorway by a well-secured crew member. 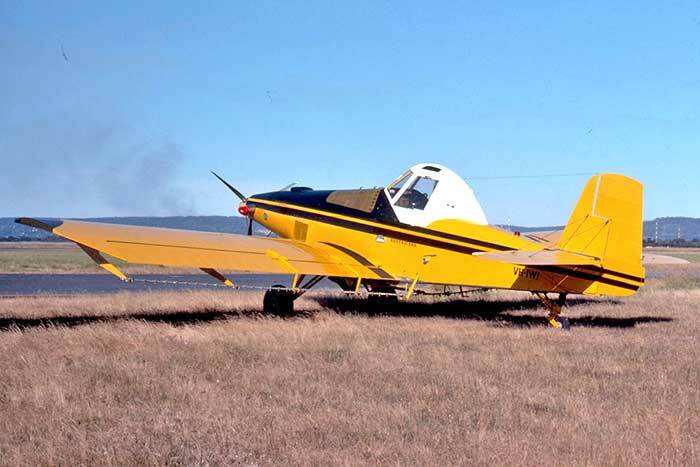 The earliest known WA commercial dusting operator was former RAAF wartime pilot Robert S. Couper at Abany WA, who went on to form Bob Couper Co, a major aerial ag business at Cunderdin. Aerial Agriculture (WA) Pty Ltd, 141 Adelaide Terrace, Perth, to 7 Sherwood Court, Perth. Chief Pilot Donald Maxwell Taylor. In early 1958 the first two Tiger Moihs were returned to Benyon's ownership. probably indicating the end of the partnership. 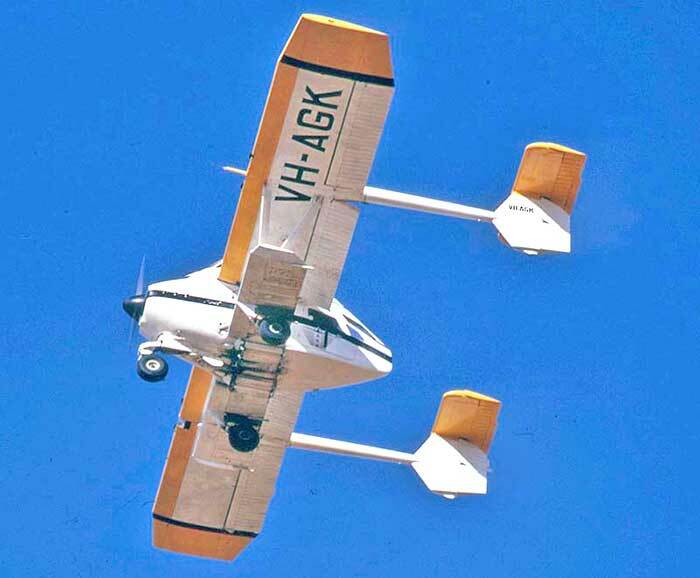 Max Taylor purchased a replacement Tiger VH-TSC from Tigerspread, Wagga NSW in his own name, changing it to Aerial Agriculture (WA) Pty Ltd and flew it to finish the 1958 season in the name of Aerial Agriculture (WA) Pty Ltd. Manager and Chief Pilot Donald Maxwell Taylor. Max Taylor became a widely known WA ag pilot who formed new companies with new partners and financial backers every few seasons over the next 20 years. Aerial Enterprises was his first operating name. On 22.1.53 he applied for a State Licence quoting "I have two Tiger Moths equipped in readiness for the coming season. I have considerable experience and have carried out experimental work at various research stations in WA." A licence was issued, but Taylor did not purchase his first Tiger Moth until 4.53, followed by two RAAF disposals Tigers which completed civil conversions at Maylands until 7.53 and 5.54. -DCA Airwork Licence was issued to D.M.Taylor trading as Aerial Enterprises on 14.5.53, with Tiger Moth VH-ARU equipped for spraying. -Pilots included Hal Watts, George J. Meadows, K.F.Funker. In September 1955 Taylor was injured in a car accident and there was a dissolution of his partnership with a Ballidu farmer. -Taylor wrote to DCA in 4.57 stating "Aerial Enterprises was disbanded in November 1956 and a new company is now formed." Founded in 1947 at Maylands Aerodrome, Perth by experienced aircraft engineer Stanley C. Doggett and wartime RAAF pilot Cyril A. Flood as a light aircraft maintenance and sales company. 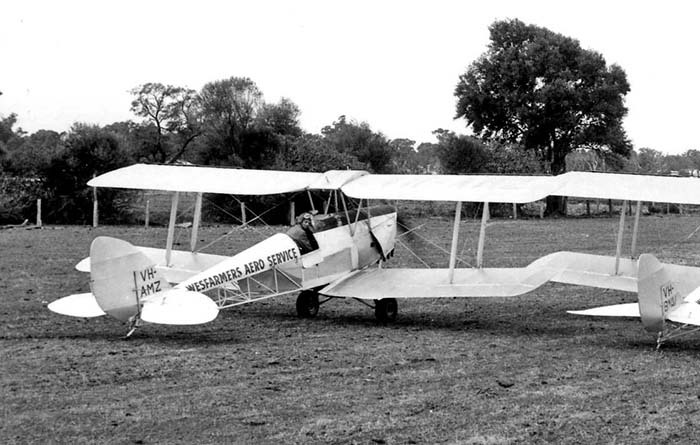 Became the principle maintenance business at Maylands, purchasing RAAF Tiger Moths for civil conversion and importing Austers and other types from England for WA customers. 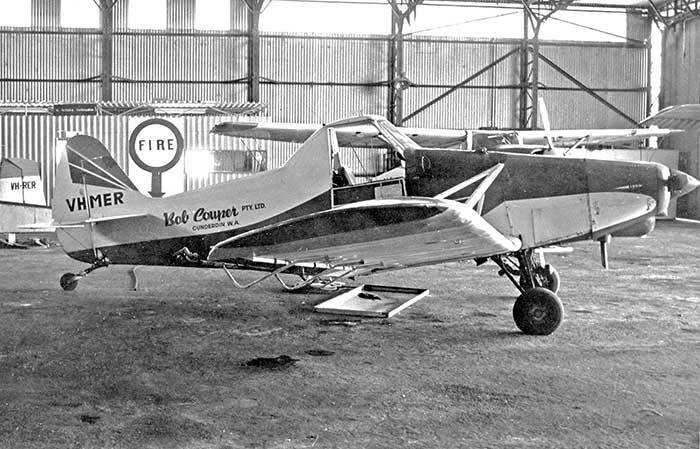 -During 1952 Cyril Flood was keen to enter the aerial agriculture field and a Tiger Moth VH-BNW was purchased 4.52 and modified in their Maylands hangar with a hopper in the forward seat position. 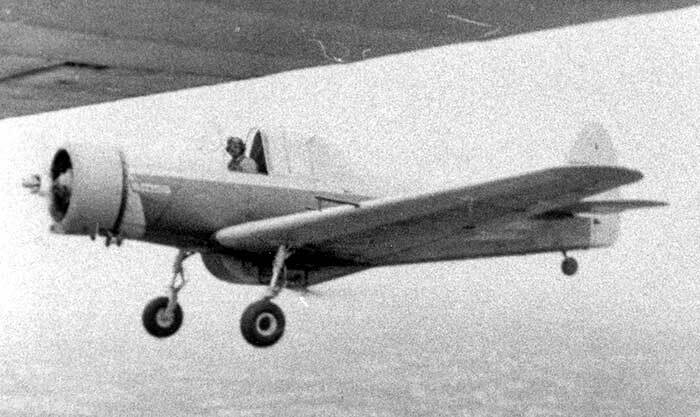 It was test flown 14.6.52 as a duster and operated for the 1952 & 1953 seasons. 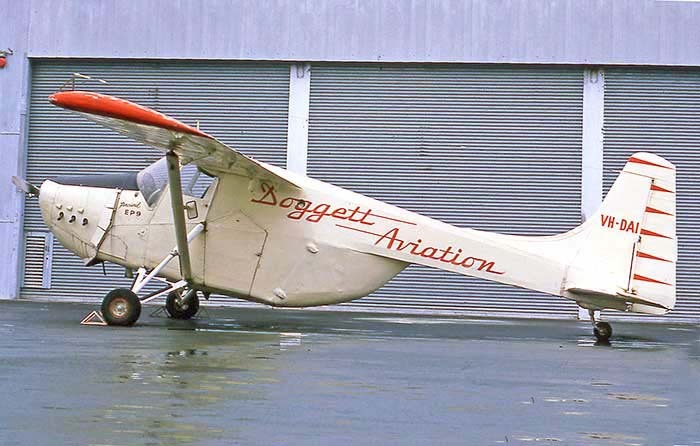 - Stan Doggett left Aero Service Pty Ltd to establish his own maintenance and charter business at Maylands named Doggett Aviation and Engineering Co. Later Doggett was to add aerial agricuture operations contracting with Elders, in direct competition with Cyril Flood. It is reported that the two remained good friends. -Agricultural operations grew and more Tiger Moths were acquired. Cyril Flood was Manager/Check Pilot. Harold Summerfield, J.Turner, R.Teichman, Ben Ward. 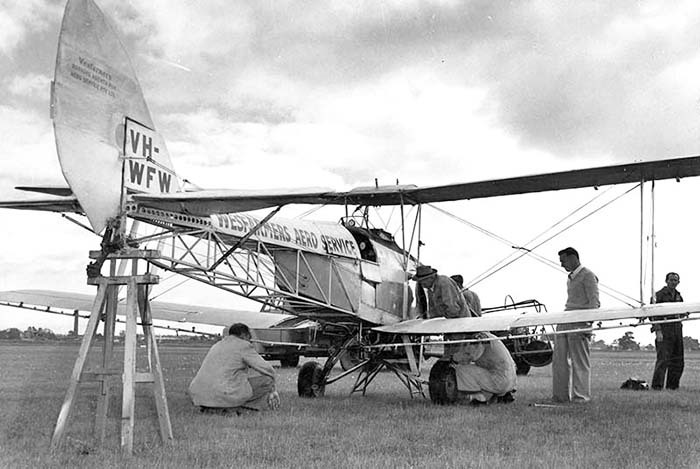 -In 1959 the Tiger Moth fleet was re-registered into the VH-WF block to recognise their partnership with Westfarmers Pty Ltd, which supplied their fertiliser and insecticides. 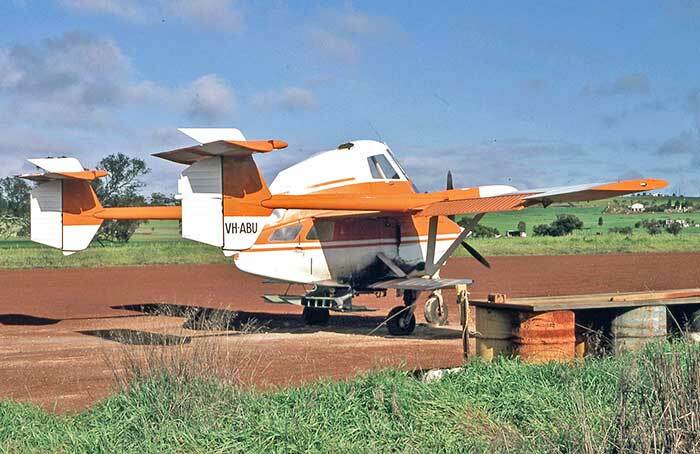 -During 1961 Aero Service egan operating in association with former competitor Basil Taylor & Co Pty Ltd.
-In October 1962 Aero Service Pty Ltd and Basil Taylor & Co Pty Ltd merged to form Agricultural and General Aviation Pty Ltd, Maylands. Directors of the new company AGA included Cyril Flood and Basil Taylor. 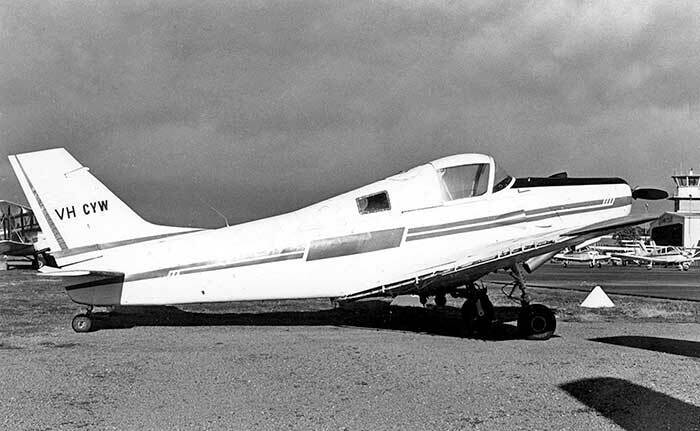 The same aircraft as VH-WFU after a forced landing near Williams WA 3 July 1960. It was quickly repaired. 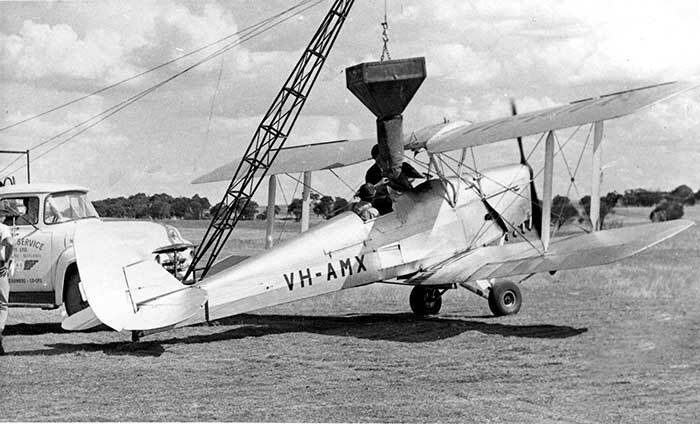 Tiger Moth VH-AMX in 1957 loading super from a lifting hoist attached to the Aero Service truck. -13.6.57 DCA Airwork Licence issued for Airwork Pty Ltd, using Tiger Moth and Wackett Cropmaster types. -20.6.57 Application for WA State Licence, states its activities would be confined to aerial agriculture only. Chairman of Directors was former RFDS (WA Section) pilot A. J.Williams. Chief Engineer Cliff J. Brown. see FROM WACKETT TO CROPMASTER in this series. -by 1958 Airwork leased a hangar at Geraldton Airport with workshop facilities. Much of their work was in the Geraldton district. 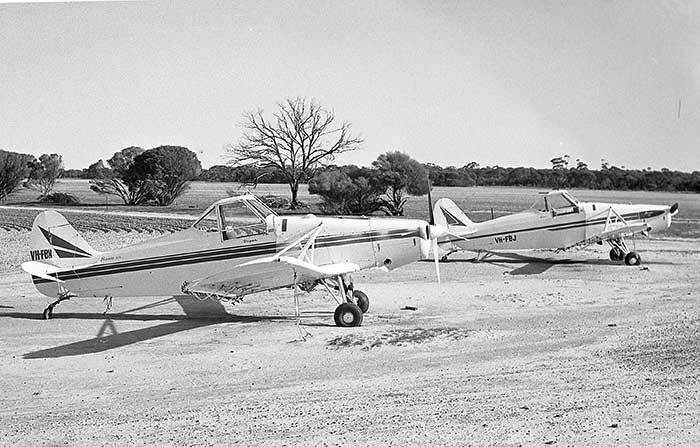 -In early 1959 Bill Boulden's involvement with thee Wackett Cropmasters and KSAS associate company Yeoman Aviation's all-metal YA-1 Cropmaster development resulted in him leaving Airwork Pty Ltd to establish a new business Air Culture Pty Ltd, Perth to operate and market the YA-1 Cropmaster 250. - A DCA WA Region report in 2.60: "Mr.W.G.Boulden as a member of Airwork Pty Ltd arranged the original procurement of VH-FBF and FBD from Kingsford Smith Aviation Service, Sydney, Airwork Pty Ltd has now changed ownership completely and the original shareholders have sold all their shares held in the company. The new shareholders do not intend operating the Wackett Cropmasters, but will continue operatioms with Tiger Moths. Boulden's connection with Airwork Pty Ltd has been severed and he is now working in conjunction with Yeoman Aviation, Sydney. Airwork, other than Boulden, were never very keen on the Wackett and with Boulden's departure from that company there was some difficulty, or rather diffidence, in the supply of spare parts by Yeoman to Airwork Pty Ltd. On the reorgansation of Airwork Pty Ltd the Wacketts were offered to, and accepted by, Boulden." 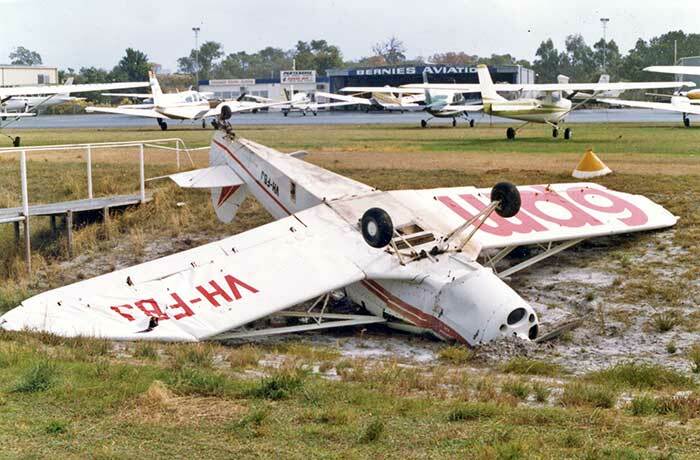 - by 1962 Airwork Pty Ltd had ceased to operate. A closing down auction of company assets held in the Geraldton hangar included workshop equipment, damaged Tiger VH-ARU (to a Geraldton farmer who was a shareholder in the comany), airframe sections of Tiger VH-ARU (to John Forrest, Carnamah) and airworthy Tiger VH-PCI (sold for £75 to Steart Stubbs, Comet Gold Mine, Marble Bar WA). DH.82 VH-BTM early 60 wreck purchased from W.H.Benyon, Perth. Not rebuilt. 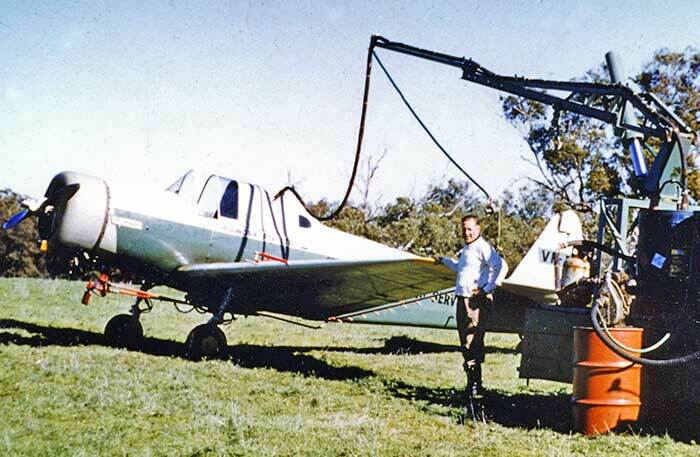 Bill Boulden reloads the chemical hopper of an Airwork Pty Ltd KS.3 Wackett-Cropmaster. 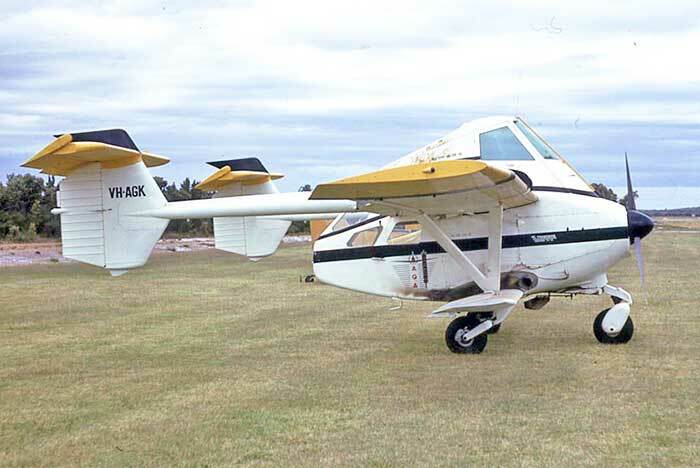 Two rare views of the Airwork Pty Ltd Wackett-Cropmasters VH-FBD & FBF taken from a Cessna. Perth commercial pilot Bill Boulden had entered the aerial agriculture business in 1957 when he formed Airwork Pty Ltd, Perth (see above). 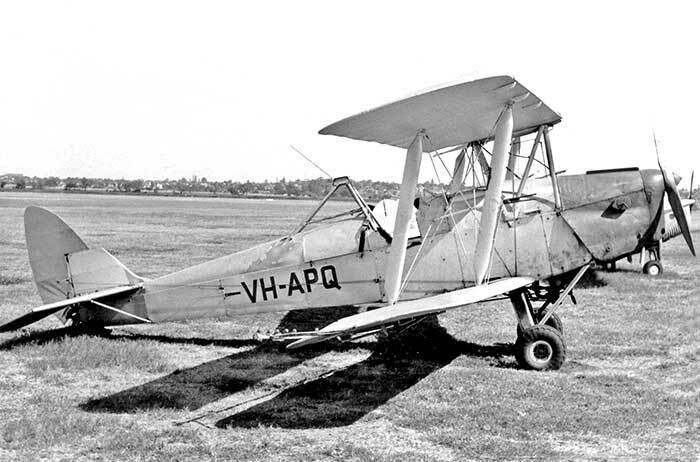 He believed that the Wackett-Cropmaster agricultural modification of war disposals CA-6 Wackett Trainers by Kingsford Smith Aviation Service, Sydney were an inexpensive improvement on the ag Tiger Moths in widespread use across Ausralia. 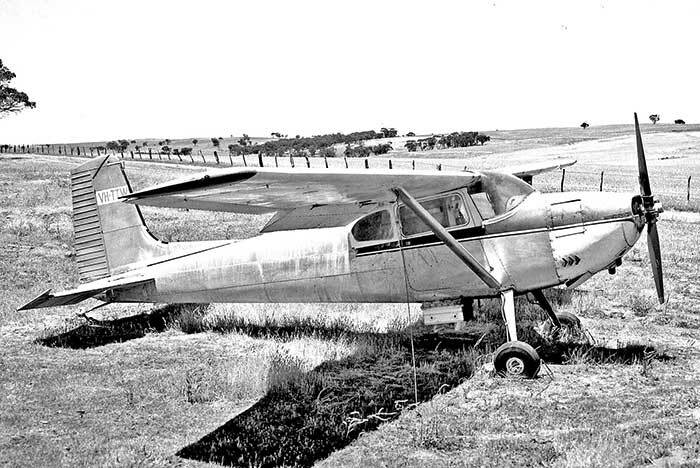 He ferried two original model KS.3 Cropmasters with wooden wing and tailplanes from Sydney to Perth and flew them as sprayers for Airwork Pty Ltd.
By early 1959 Boulden's financial involvement in KSAS associate company Yeoman Aviation's development of the all-metal YA-1 Cropmaster 250 resulted in him leaving Airwork Pty Ltd to establish a new Perth ag company to operate and market the YA-1. -2.60 Report: W.G.Boulden is Managing Director of Air Culture Pty Ltd and Operations Manager of Yeoman Aviation Pty Ltd.
-10.60 Boulden negotiated a contract with Ross International Fisheries to carry live crayfish from fishing ports north of Perth. 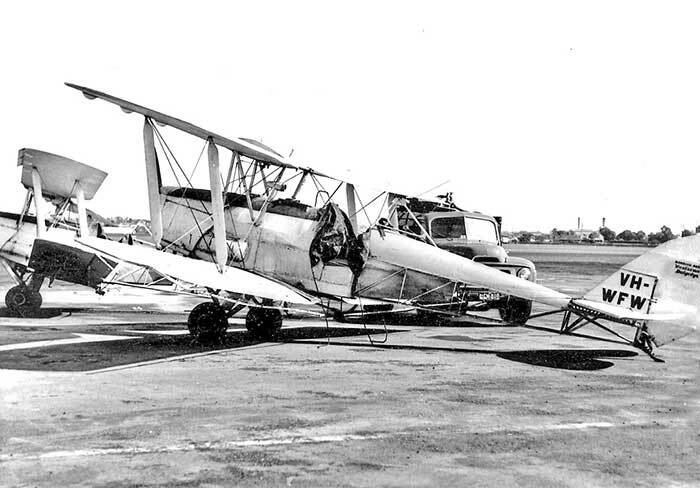 Avro C.19 VH-BIX was leased from Carsair Air Service, Brisbane and flown by Boulden and John Grummels. 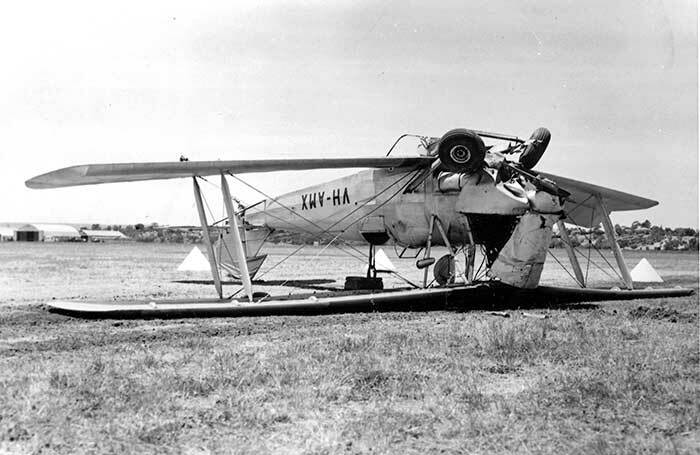 The Avro was badly damaged in a forced landing near Lancelin 22.3.61. 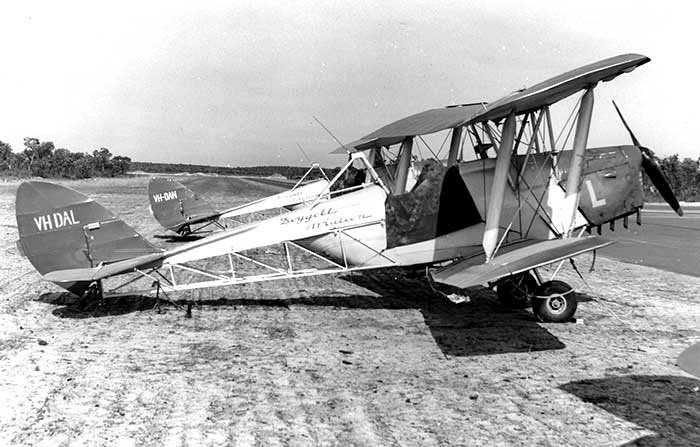 Bob Carswell supplied his Lockheed 12A VH-ASG as a replacement for several weeks until the contract ended 4.61. -30.6.61 Maylands Aerodrome closed to operations. Air Culture moved to a newly-built hangar at the new Jandakot Airport. -22.12.65 Letter from Simpson Aviation, Jandakot (Cessna dealers) to DCA advising they are negotiating the takeover of Air Culture Pty Ltd. The takeover was completed in January 1966. 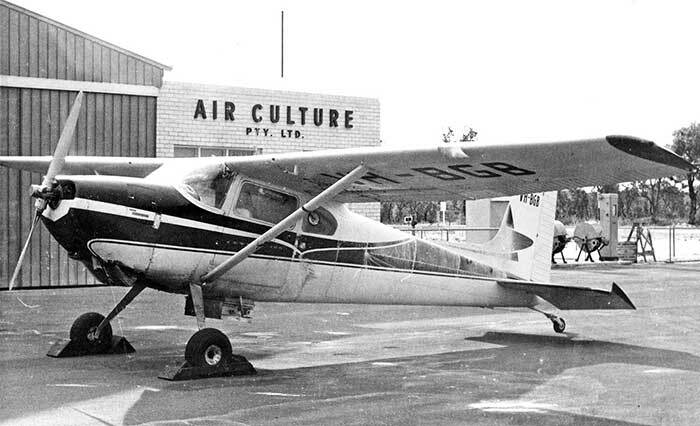 Air Culture continued under its own name but Simpson operated their SAMAV Flight School Cessna 150s from the Air Culture hangar and office block until their own hangar area was extended. -10.66 Air Culture purchased its first non-ag aircraft Cesna 337 VH-RZO from Simpson Aviation to be used for charter work. -67 W.G.Boulden operated an associate business Boulden Air Charter. Hired Cessna 182F VH-CMN and Cessna 337 VH-RZO from Air Culture and Cessna 337 VH-RDY from Simpson Aviation. All three had "Bouden Air Charter" painted on for a period. .67 James Aviation Ltd of Hamilton NZ purchased a financial interest in several Australian agricultural firms including Air Culture. 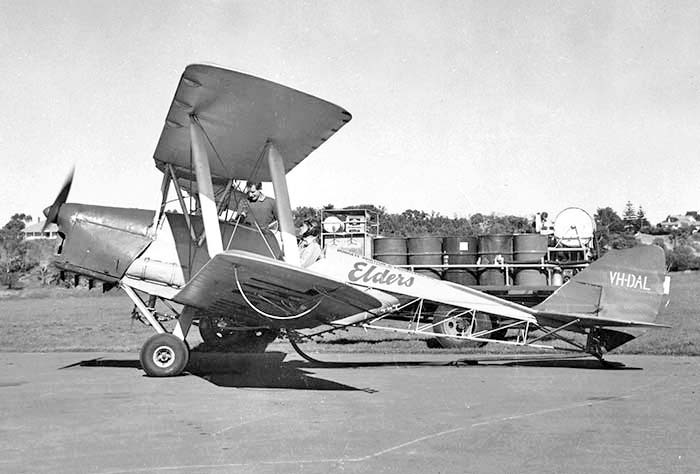 James offered NZ-built Fletcher Fu24s on favourable terms and Boulden operated 5 Fletchers. -6.68 Trans West Air Charter Pty Ltd, Jandakot took over Air Culture Pty Ltd. The combined companies are owned by Jardine Matheson & Co (Australia) Ltd and James Aviation Ltd, Hamilton NZ. -68 Air Culture Pty Ltd operated Fletchers for its last two seasons. .70 All operations ceased early 1970. Boulden was still Managing Director to the end, the last Operations Manager was G.D.Vanderfeen. Bill Boulden died 10.June 1986 due heart attack on Cottesloe Beach, Perth after a 400 metre swim with the Cottesloe Crabs winter swimming club. He was aged 76. After RAAF service he had played football for Claremont and been a champion swimmer and high-tower diver. KS.3 Wackett-Cropmaster VH-AJH 5.59 from Yeoman Aviation. Retired at Jandakot 5.64, stored. 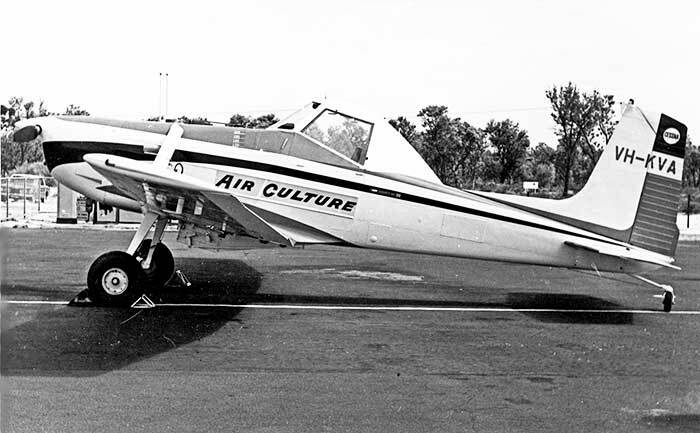 Air Culture's first KS.3 Wackett-Cropmaster VH-FBE at Beacon WA in May 1959 flown by Bill Boulden. 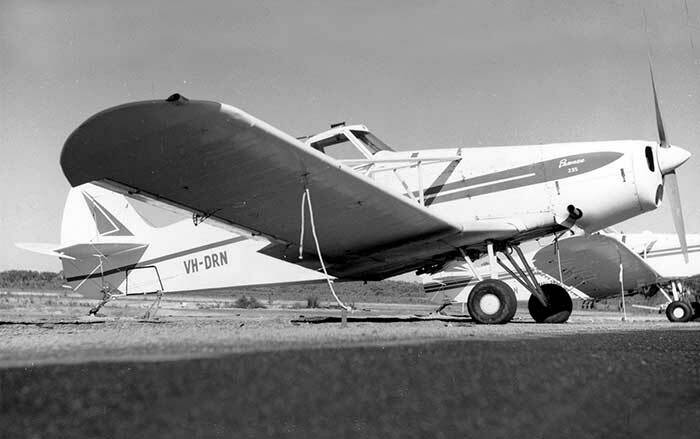 The first Yeoman Aviation YA-1 Cropmaster under construction at Bankstown in 1959..
Avro Anson 19 VH-BIX after Bill Boulden's forced landing on rough terrain near Lancelin WA 22 March 1961. Painted on the fuselage sides was "Crayfish Transporter - We Bring Them Back Alive". Air Cuture's first Yeoman YA-1 Cropmaster 250 VH-CXQ outside the Yeoman hangar at Bansktown. 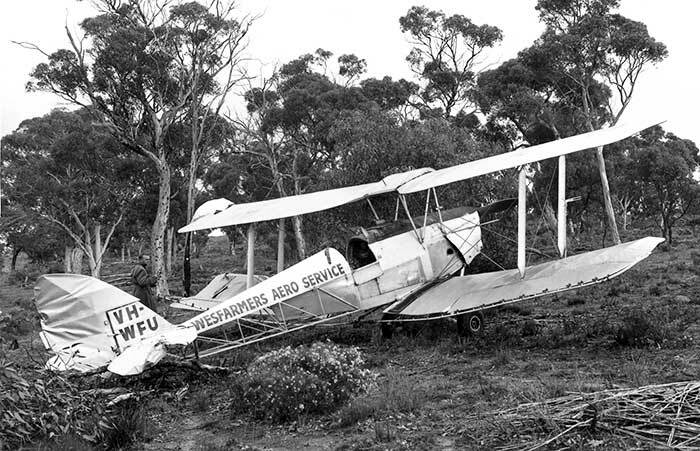 VH-CXQ struck trees while spraying webworm infestations near Narrogin on 20 June 1965. 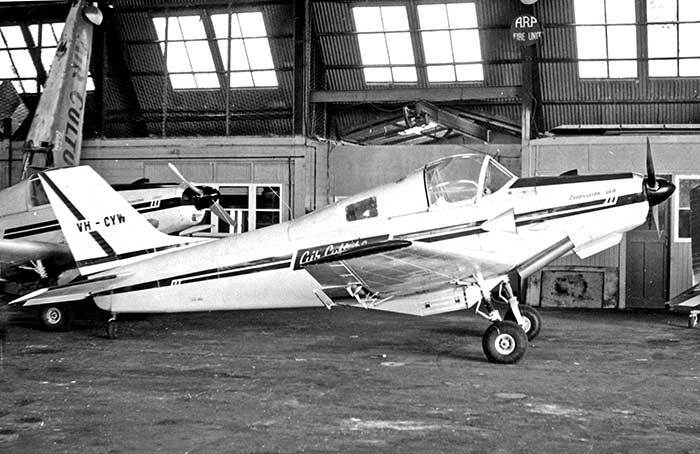 Yeoman Cropmaster 250 VH-CYW in Air Culture's hangar at Maylands in March 1963. 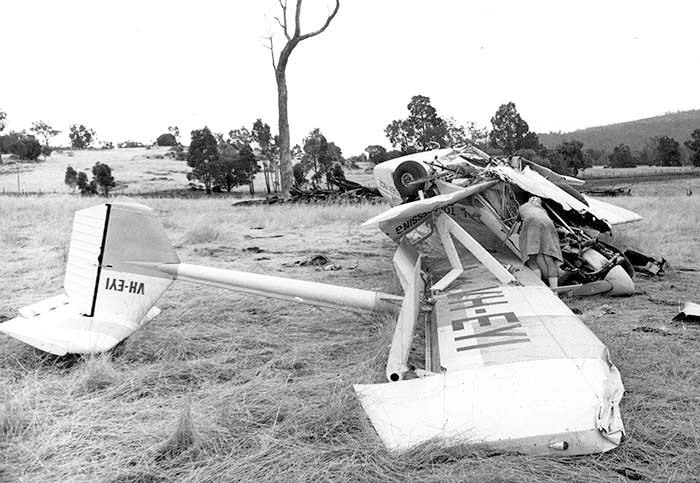 Cessna 180 VH-DBN's demise at Green Range near Albany 28 March 1966. 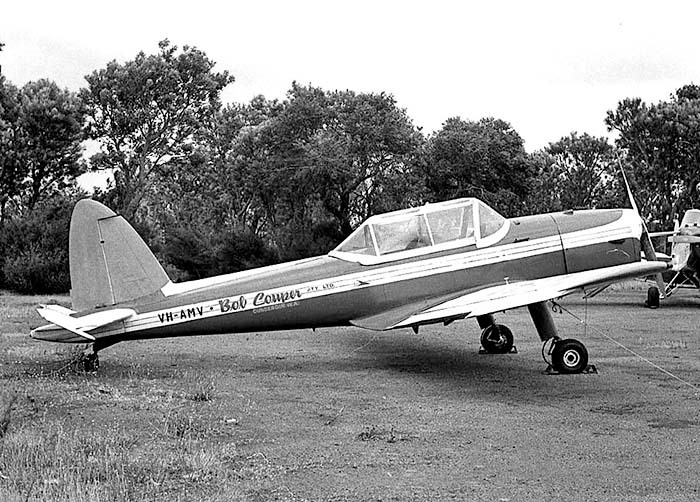 Pawnee 235 VH-KSD was leased by Air Culture during 1965 from Duttons Aerial Sowing, Glen Innes NSW. On 16 July 1965 it suffered the humiliation of a forced landing without damage on an oval at Willagee, Perth. Here the Air Culture pilot gives his details to a policeman, surrounded by school children. 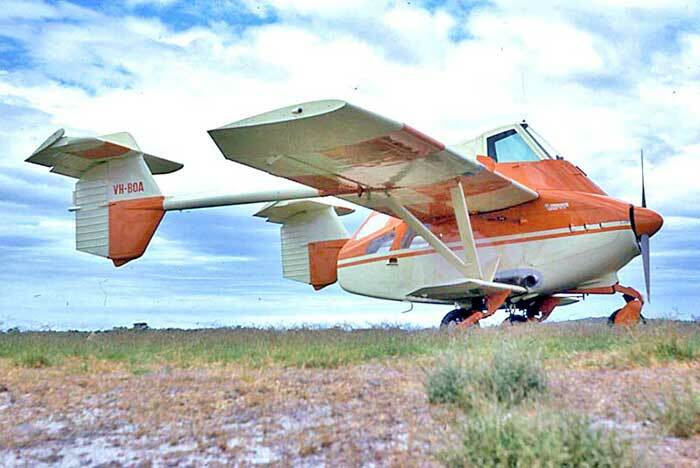 DHC-2 Beaver VH-AAJ at Jandakot during its 1966 hire from Aerial Agriculture Pty Ltd, Sydney. 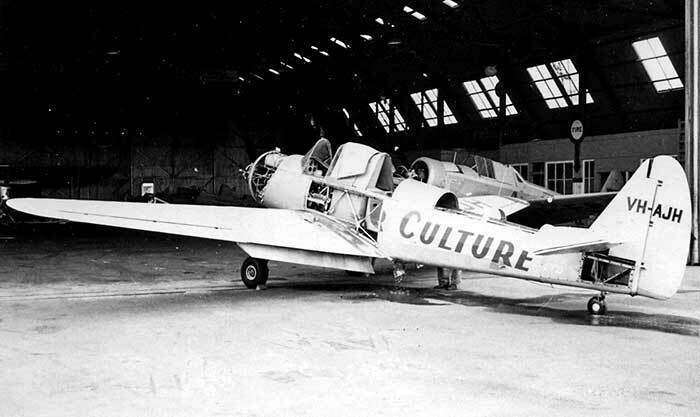 Air Culture's Fletcher Fu24A/1 models VH-EOF and VH-EOG were fitted with cabin windows. 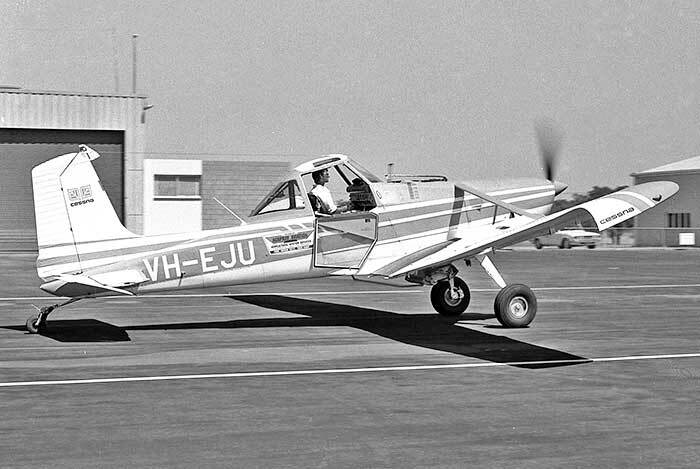 VH-EOF photographed at Jandakot in July 1969 by Roger McDonald. Founded March 1962 by the business merger of two Perth aerial agricultural companies Aero Service Pty Ltd and Basil Taylor Co Pty Ltd. The two had been operating in association over the previous year. AGA was to provide agricultural work, general aviation aircraft maintenance, and charter flying. AGA commenced operations in its own name in November 1962 after required licences and DCA approvals had been finalised. AGA Directors included Cyril A. Flood from Aero Service and Basil Taylor. Operations Managar was Cyril Flood, General Manager Basil Taylor, Chief Pilot Arthur Andrews. - Concern within the aerial agricultural industry and DCA over the high pilot casualty rate for Tiger Moth accidents compared with other aircaft types resulted in DCA ordering that Tiger Moths be phased out of agricultural flying. From 1963 each operator was required to reduce its Tiger Moth fleet by a third each year. 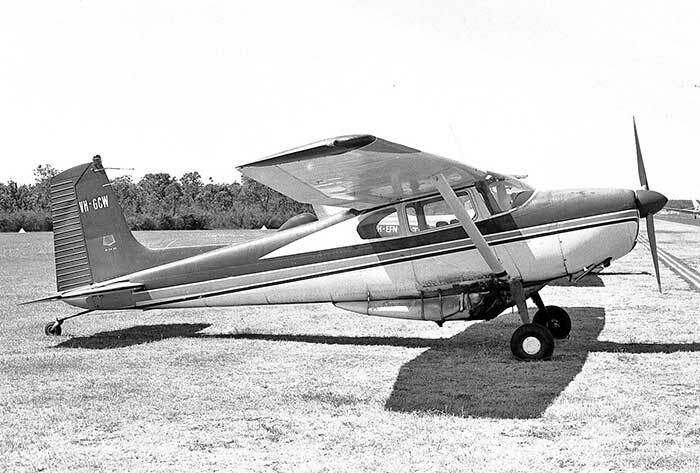 To replace retired Tiger Moths, AGA ordered 3 new Cessna 185As for delivery early 1963. AGA sold all its Tiger Moths plus spare engines and parts to Bob Couper Co, Cunderdin WA in a package deal in May 1963. Five were ferried to Cunderdin, the remainder moved by road. 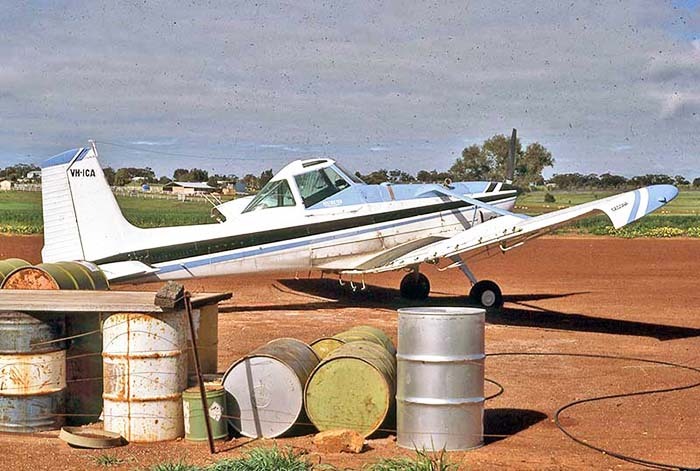 - 10.62 an early contract was to base a Cessna 180 at Kununurra in the far north of WA for 10 months for spraying of experimental cotton crops. Resukts were poor and in 11.63 chief pilot Arthur Andrews brought up Cessna 185A VH-AGG fitted with a new rotary atomiser dispenser. -30.6.63 Maylands Aerodrome closed to operations. AGA moved to a newly-built hangar at the new Jandakot Airport. Their hangar was the hangar with office block was the largest of the agricultural operator hangars, designed to allow expansion of general aircraft maintenance. - By 1970s AGA at Jandakot was an established ag and maintenance organisation. General manager was still Basil Taylor, Works Manager Allan K. Boothey, senior engineer Brian Hepple. Maintenance was carried out on pressurised and turboprop aircraft. The AGA hangar was the base of other operations such Kevron Photographics' growing fleet of survey aircraft, Cliff Brown Aircraft Sales and Service Pty Ltd and charter operators Altair and Airwork Australia. 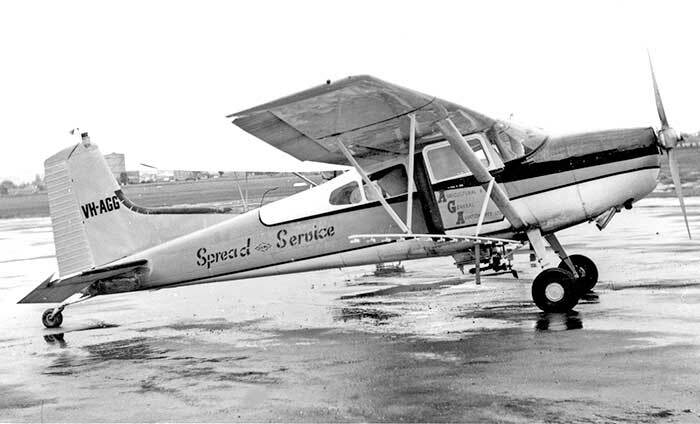 AGA Tiger Moth VH-WFW in service at Maylands in May 1963. 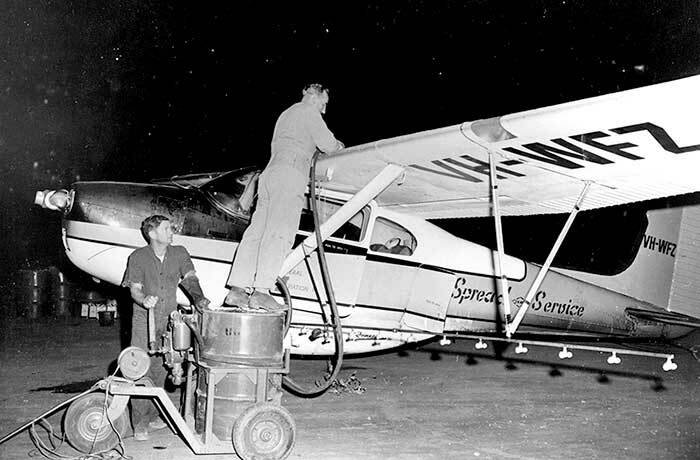 AGA Cessna 180 VH-WFZ at Kununurra WA in July 1963, refuelling during night spraying of cotton crops. 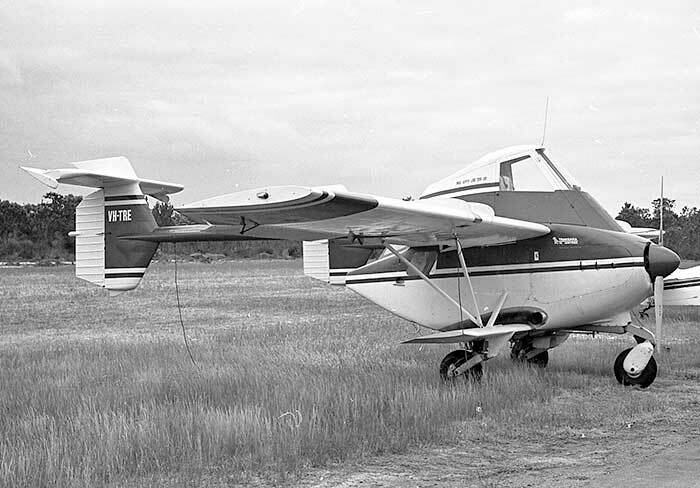 Transavia PL-12 Airtruk VH-TRE at Jandakot in October 1968 while on six month evaluation by AGA. 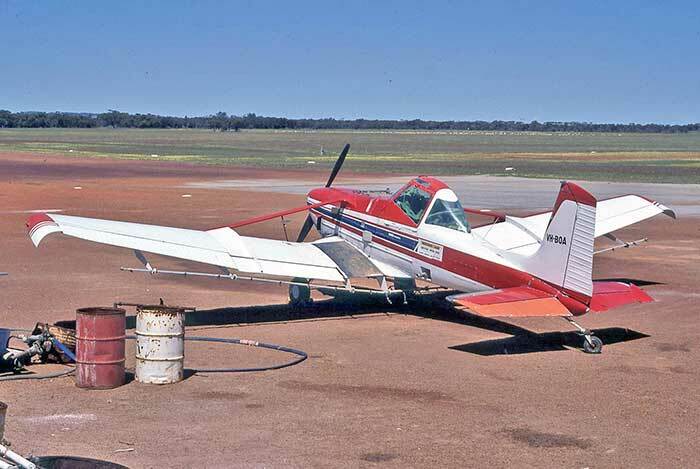 John A. Turner, Como, Perth established this aerial ag business in 1972 when he acquired the Sasin-Aerostructures SA-29 Spraymaster VH-BCA from Bob Couper Pty Ltd at Cunderdin. He operated it himself until 1975 when additional aircraft were added all registered in the name of J.A.Turner. The company's maintenance base was Kellerberrin. 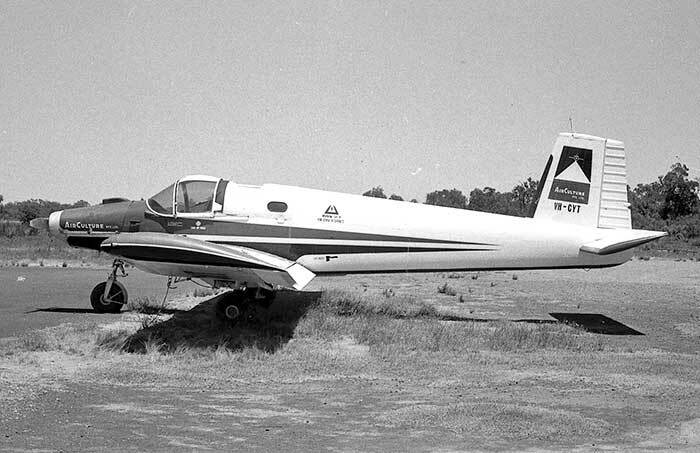 In June 1977 Beech Baron VH-UPJ was purchased to widen the range of services offered but sold two years later. 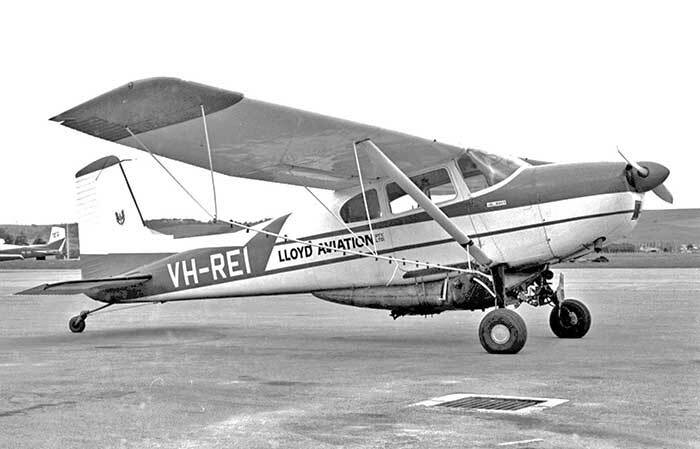 Avon Aviation Pty Ltd was registered in 1966 by partners Keith Hobman and Ken Black. The company was named after the Avon River which flows through the town of Northam. Keith Eric Hobman was Manager of Avon Aviation. He had been chief pilot of agricultural operator Doggett Aviation, Perth since 1960 and become founder Stan Dogget's son in law. While employed by Doggett, Hobman had flown charter for other Perth companies and in 1965 had applied for and been issued DCA Charter and Airwork licences in his own name. In November 1965 he had proposed a passenger and parcel charter service on 3 routes connecting small towns south and east of Perth using a Beech Bonanza yet to be purchased. He was still with Doggetts and did not proceed with this venture. trucking contractor with a milk home delivery contract for Northam. He was nominated as Guarantor for Avon Aviation. 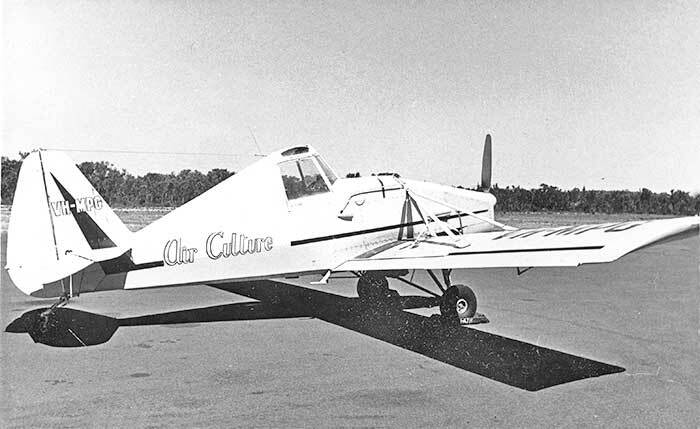 11.68 Avon Aviation reports that it is conducting agricultual spraying operations only, using a Cessna 180 leased from H.J.Sands. 1969 Operations ceased early 1969. VH-TTW was left parked in the weather at Northam airfield. 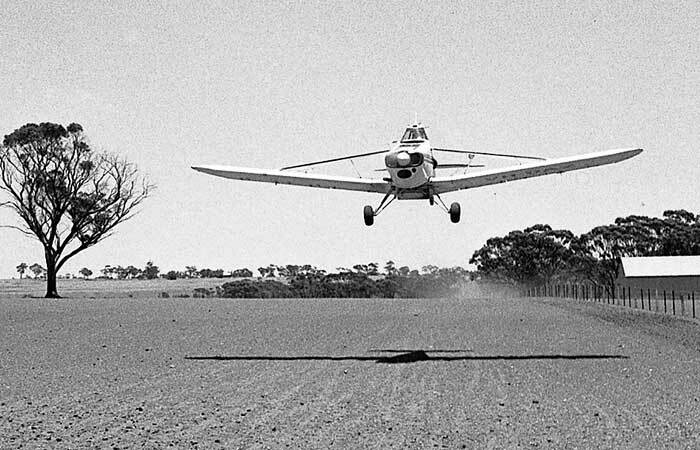 1970 Keith Hobman was ag pilot with Bob Coper Co, Cunderdin. Avon Aviation Cessna 180 duster VH-TTW at Northam in December 1969, retired and looking very shabby. James H. Baker was the proprietor of the Manly Hostel and Manly Tea Rooms at Cottseloe Beach, Perth. Baker went on to other projects, in 1970 purchasing a large consignment if railway equipment unclaimed at Fremantle port from a failed venture in the Pilbara iron ore mines and by 1971 was a Director of Indonesian Metals Exploration Co.
Tiger VH-BTM crashed 1.8.59 when pilot P.A.Maarleveld struck trees during ag work. DCA WA Region accident report includes this candid remark: "The operator, Benyon and Pearson, is one of those "one-aircraft/new pilot each season" type operations." 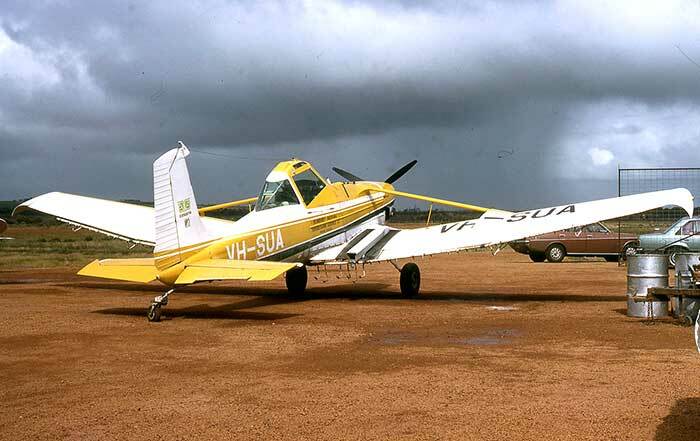 Ag operations had ended by early 1960 when the remaining Tiger VH-ARU was hired to Airwork Pty Ltd, Perth. 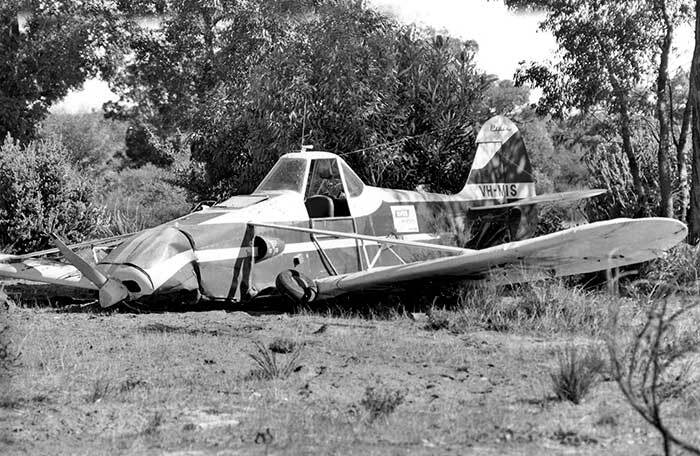 It crashed in August 1960 while operated by Airwork, and the wrecks of both Tigers were sold to Airwork Pty Ltd.
DH.82 Tiger Moth VH-ARU 4.58 ex Aerial Agriculture (WA) Pty Ltd. Hired 60 to Airwork Pty Ltd, crashed 1.8.60 in Airwork service. 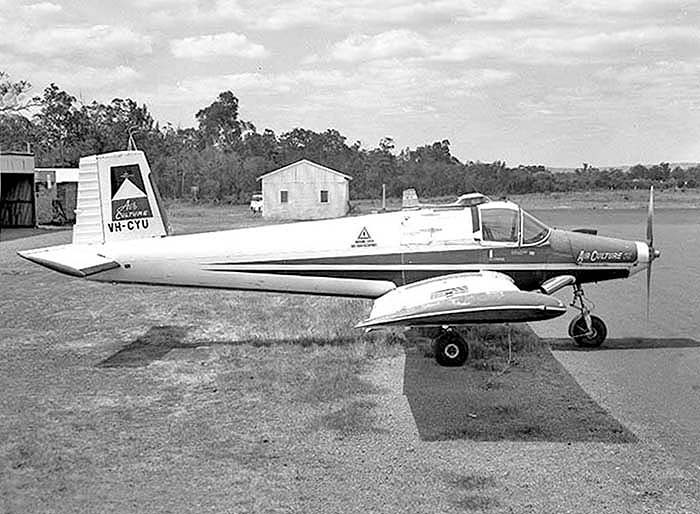 Ian Blaxell and John Grummels operated this air charter and aerial agriculture partnership from 1959 based Maylands Aerodrome, Perth. They contracted to Kwinana Chemical Co, Perth for their fertilizer and insectides. 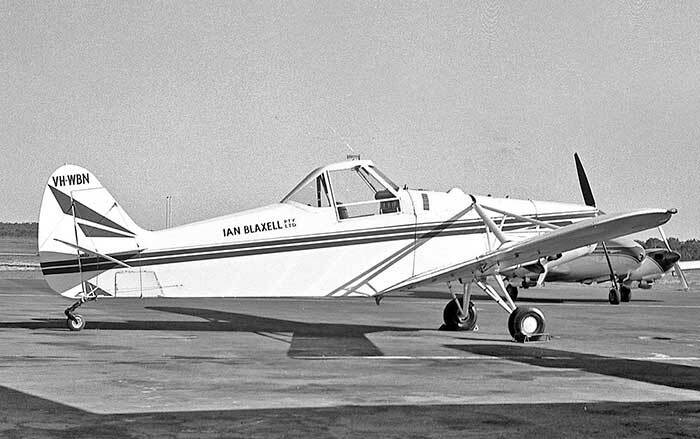 Ian F. Blaxell had been a pilot for Doggett Aviation for the previous three years, flying agricultural work as well as charter with Austers. 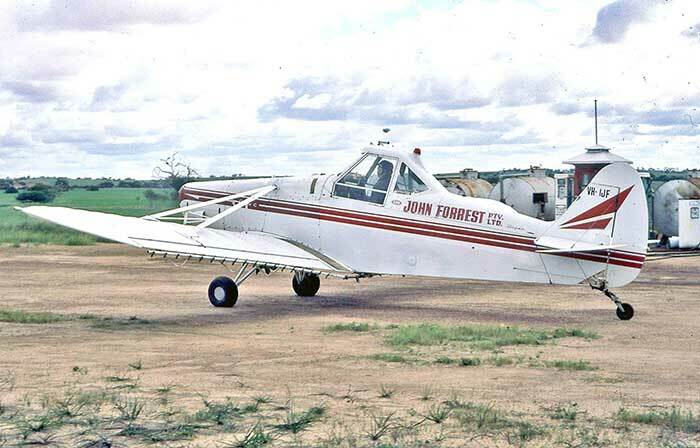 He had been based at Meekatharra flying the Doggett Aviation Short Scion VH-UTV on RFDS contract. John J. A. Grummels was a Dutchman who had flown B-25s with Indonsian Air Force before migrating to Australia in November 1955. 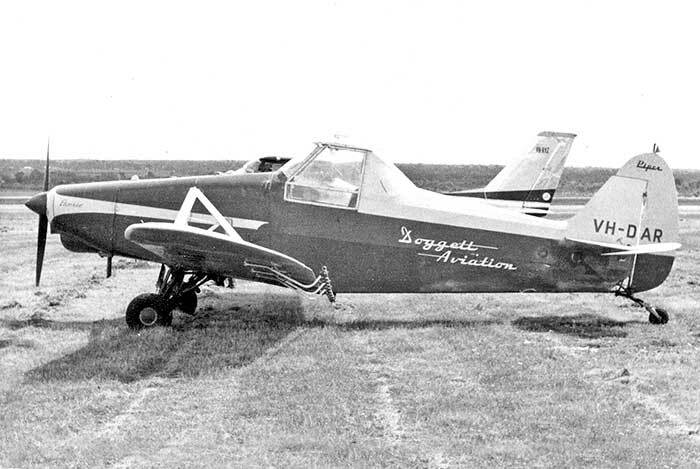 He was also flying crop spraying with Doggett Aviation in 1958. He was also flying for Air Culture during most of the Blaxell and Grummels period, including the Avro 19 on the Air Culture live crayfish contract. John was a flying enthusiast with little regard for aviation authorities. In early 1960s he conmpleted the construction of a Heath Parasol ultralight which he flew unregistered from Maylands in 1964 after the aerodrome was closed. 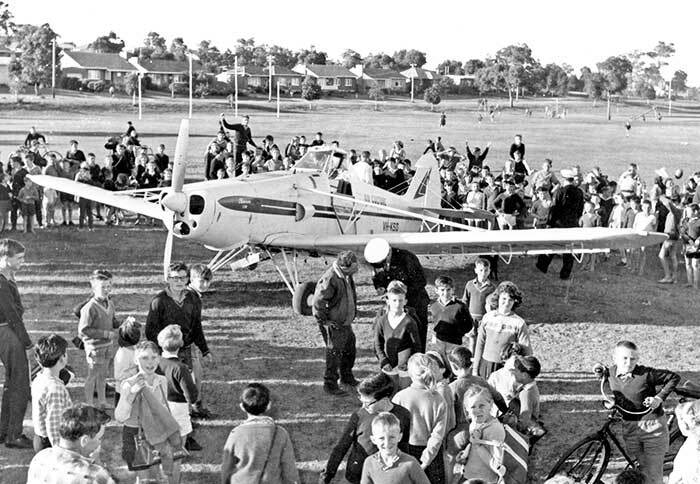 He was fined £50 by a Perth court in March 1965 for flying the Parasol Maylands-Jandakot-Kellerberrin. By 1970 Grummels was in very poor health which he blamed on his exposure to DDT and was an advocate for banning DDT spraying. Ian Frederick Blaxell formed this new company in 1964 after Blaxell and Grummels Aviation Pty Ltd was wound up in 1963. Blaxell was Managing Director and Chief Pilot. To commence operations a new Pawnee 235 was ordered. 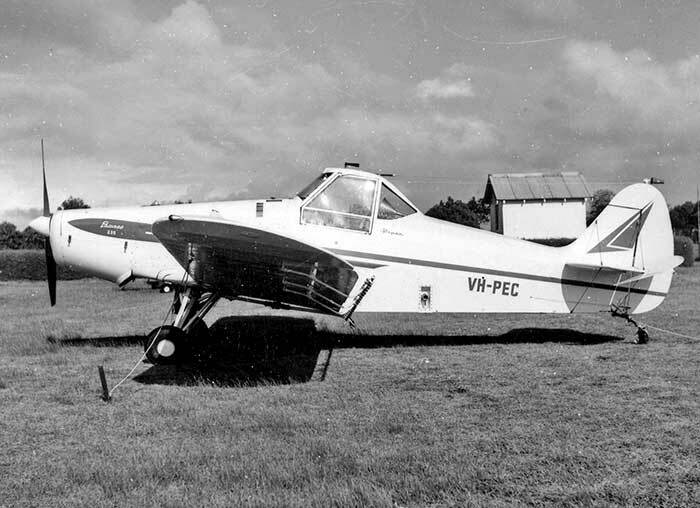 VH-PEC was assembled at Archerfield and ferried to Perth in May 1964 in time for the first season, later being reregistered VH-DRN (for Dowerin). Blaxell's loyal farmer customers were mainly in districts north of Perth. 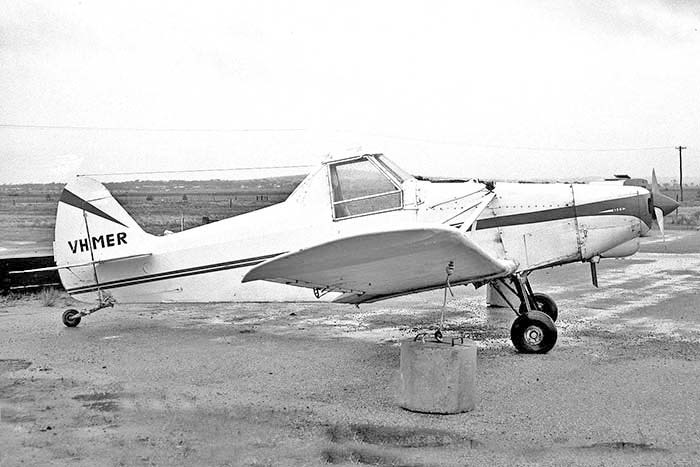 Another Pawnee 235 VH-WBN (for Wubin) followed in 1966. Blaxell continued his arrangement with pilot Gerald Ingham of Orange NSW to come to WA to fly each local season. 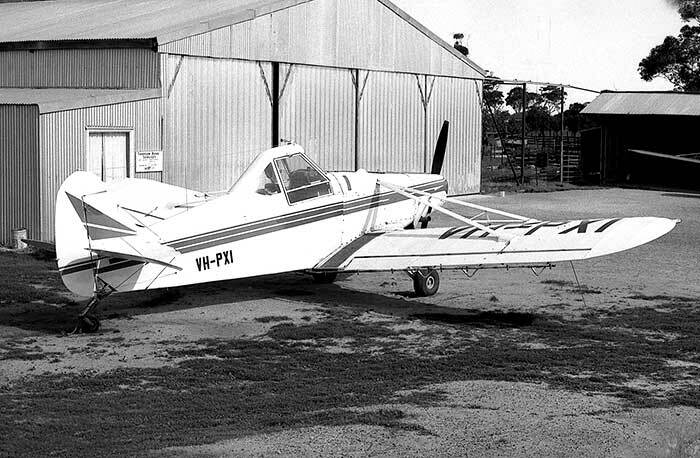 From 1967 Ingham brought his Cessna 180H VH-PKD across to operate from Blaxell's Dowerin base. In October 1975 Ian Blaxell purchased a 4 seater Beech Musketeer VH-DLW for company travel. Only weeks later it was damaged when Blaxell was landing on a strip 10 miles south of Lancelin. 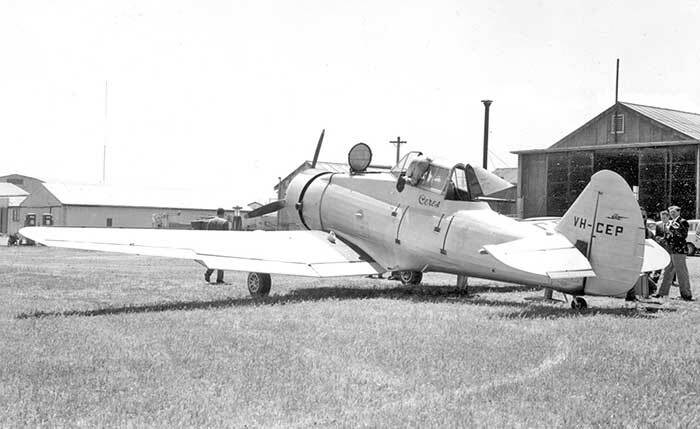 It was repaired at Jandakot by Bernies Aviation and returned to Blaxell. 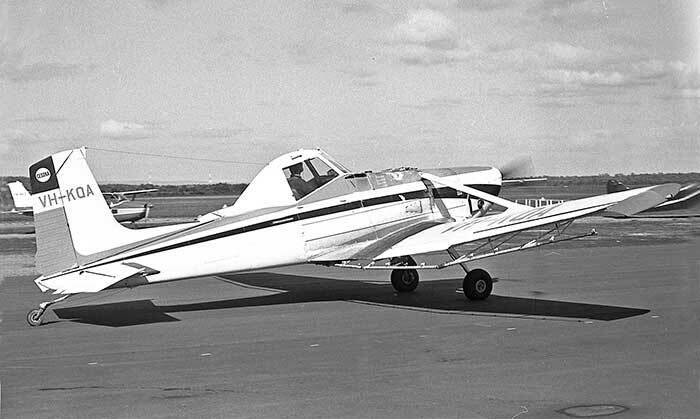 Shiny new Pawnee 235 VH-PEC sprayer at Perth Airport in June 1964, only weeks after it was assembled. 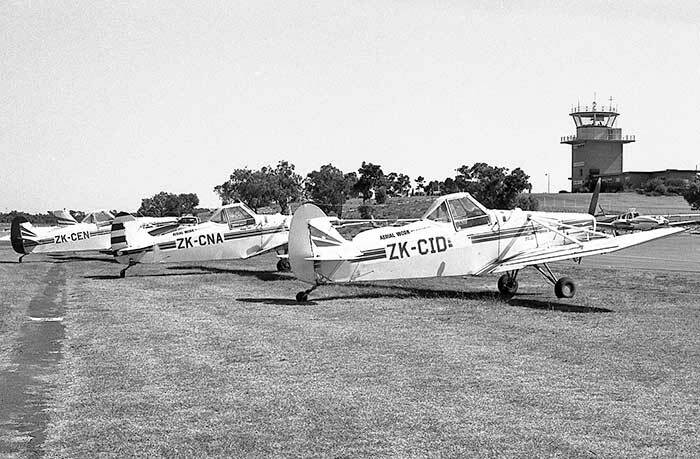 At that time light aircraft parked on a grassy area at Perth after the closure of Maylands the previous year. Bob Conn commenced his own operations in 1972 to take over the Moora area organisation of Doggett Aviation, which had ceased operations. Conn had been a Pawnee pilot with Doggett up to the previous season. Pilot N.Williams was flying for Boconn Air by 1974, and A.S.Adams by 1977. 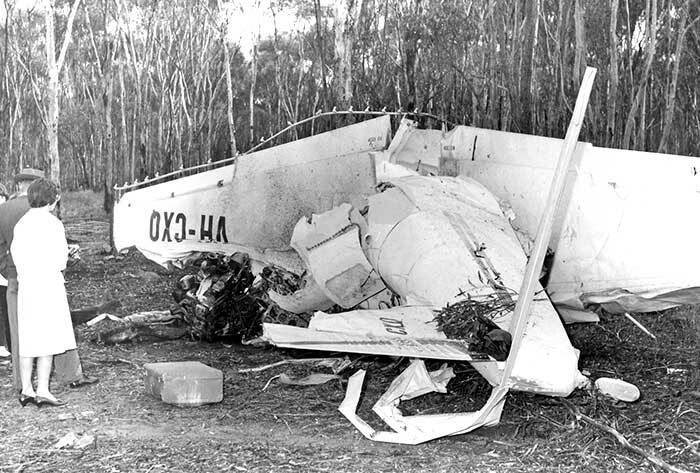 On 16.4.77 Adams was injured when he struck power lines and crashed near Moora in Airtruk VH-BOA. 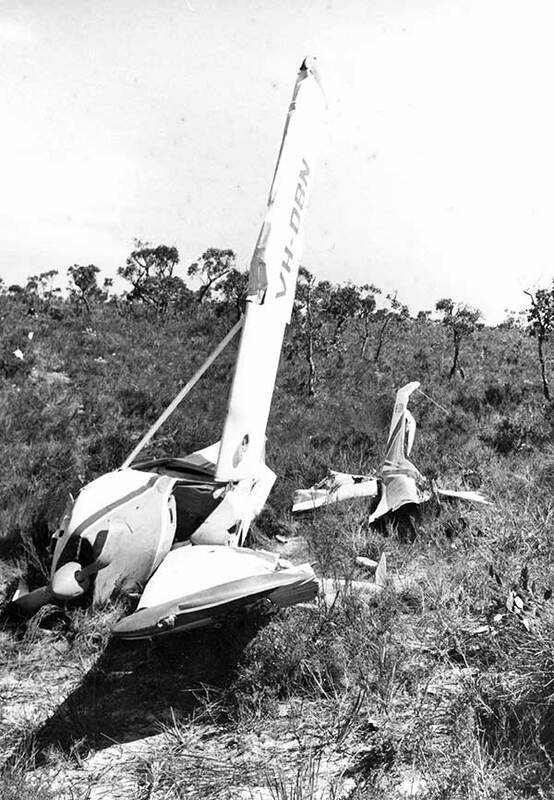 The accident was seen by Bob Conn who was flying from the same strip. Some of the aircraft listed below were registered in the name Conn Investments Pty Ltd but operated by Boconn Air. IMCO Callair A9A VH-MPI .73-74 leased ex Bunbury ATD. Returned by 9.74. 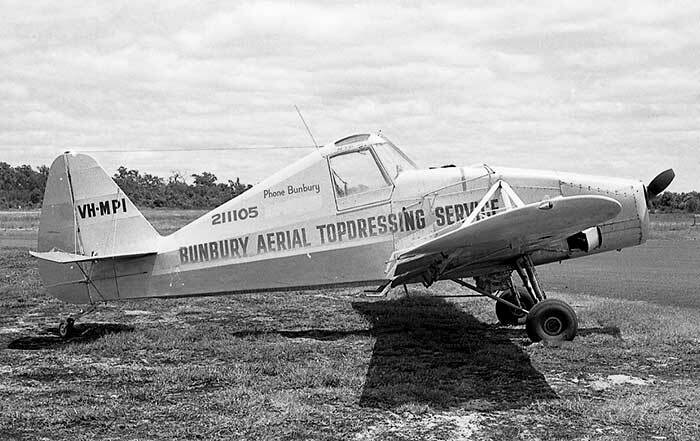 Bunbury Aerial Topdressing Service Pty Ltd was founded in 1971 by Harold "Slim" Summerfield and his wife to take over the Air Culture Bunbury organisation and client base after Air Culture Pty Ltd ceased operations during 1970. Summerfield had been an ag pilot with Air Culture for many years. Harold Summerfield was Director/Chief Pilot and his wife Mrs.E. A. Summerfield was Director/Secretary. Harold Summerfield was killed in the crash of his first Transavia Airtruk VH-EYI near Harvey on 2 February 1974. Mrs. Summerfield continued the business for a period. By 1980 it had established a base at Wagin. 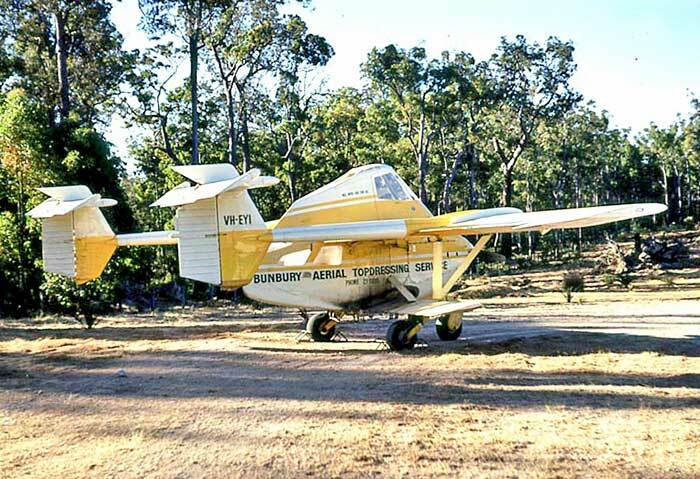 Airtruk VH-EYI on an ag strip deep inside a karri forest plantation near Kirup in January 1974. Ian C. Chambers was an ag pilot with Doggett Aviation, Perth from 1963 flying the EP-9s and CA-28 Ceres. In 1965 he left for Sydney to an airline pilot position with Airlines of NSW but in May 1968 returned to Stan Doggett to become Chief Pilot until the company shut down in 1972. During 1973 Ian Chambers established his own business under the name I.C. & C.A.Chambers trading as Chambers Agspray Aviation, Perth. Main operating base Northam. 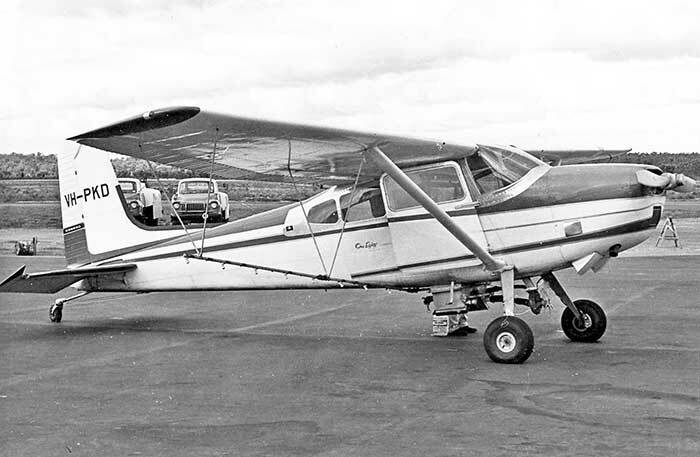 Ian joined the Northam Aero Club and a July 1974 club newsletter observed "A very good alarm clock came to town in the form of a Cessna Agwagon and Ian's dawn departures". 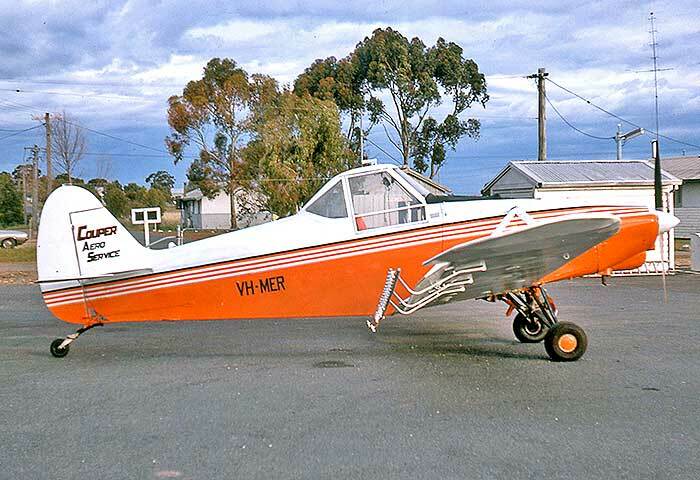 His first aircraft was Yeoman Cropmaster VH-CYW which had been acquired by Ian Dunn while it was undergoing an overhaul at Jandakot and on-sold to Ian prior to completion. 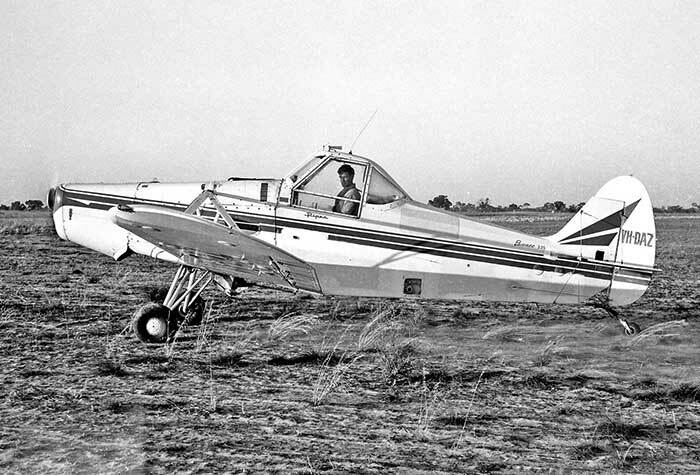 Yeoman Cropmaster 250 VH-CYW sprayer at Jandakot in June 1974 while with Chambers Agspray Aviation. 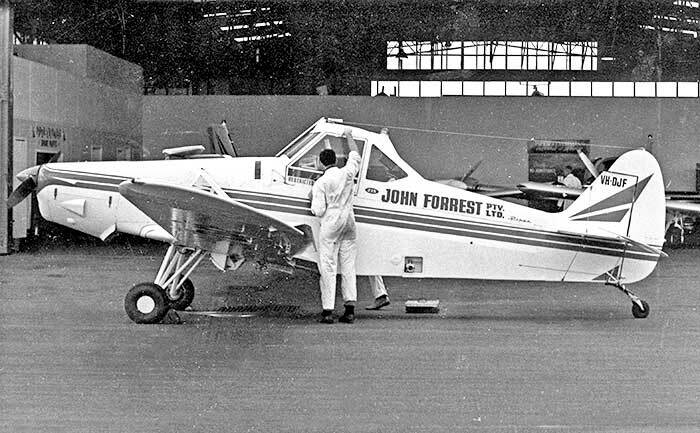 Agwagon VH-EJU at Jandakot December 1974 showing the "Chambers Agspray Aviation" winged insignia. Robert Stephen Couper returned to his home town Mount Barker WA after RAAF service during WWII. 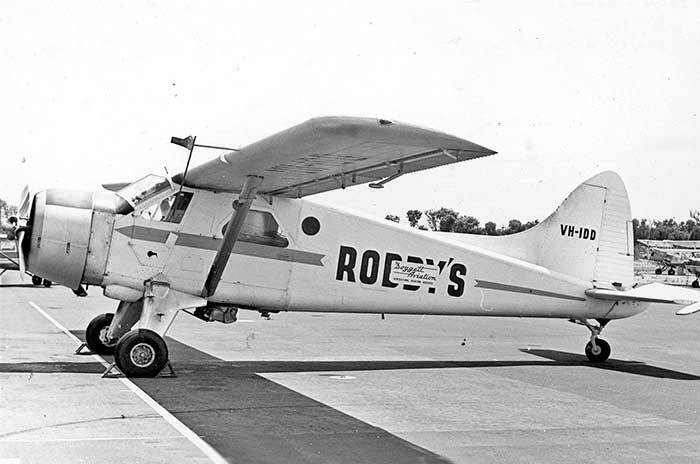 In 1947 he purchased two RAAF Ansons from disposals sales at RAAF Geraldton to be used for charter. He acquired Tiger Moths for joyriding, fish-spotting, whale-spotting between Albany and Esperance. 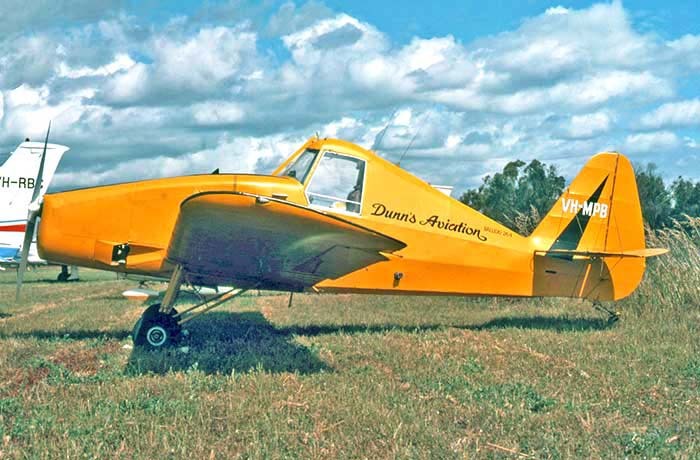 In June 1953 Bob Couper began agricultural work when he had one of his Tigers VH-AMP modified to a sprayer by Doggett Aviation at Maylands. In 1954 he formed a new business Farmair Pty Ltd, Perth in partnership with Perth commercial pilot Jim Pekin. Three years later Couper sold his interest in Farmair to Pekin and returned to Albany to operate aerial ag under his own name again. Farmair pilot Arthur Andrews came with him. Although Albany based, much of his work was farms in the Cunderdin area and in 1958 Couper moved his business to the single remaining Bellman hangar on the former RAAF Cunderdin airfield. Most of the wartime 9EFTS aircrew accommodation huts and buildings remained unused, providing storage for his growing collection of Tiger Moth airframe spares and engines. Bob Couper & Company, Cunderdin was registered as the new business name. 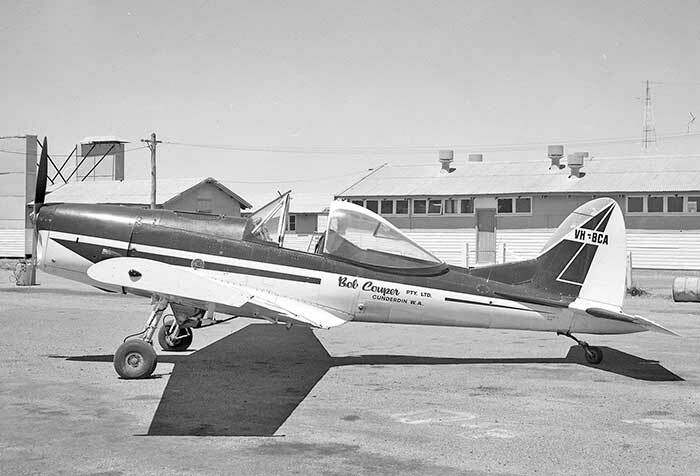 On 5.2.59 DCA amended the Airwork Licence for R.S.Couper Albany to Bob Couper & Co, Cunderdin. As well as spraying, dusting and seeding services, aircraft maintenance and charter was conducted. Auster J.5BAutocar VH-KAL owned by the company Manager Alan Fox was initially using for passenger charters. A pilot training division commenced in 11.63 under the name Central Flying School, Cunderdin, a subsidiary of Bob Couper & Co. The staff of the school were employees of Bob Couper & Co: Chief Flying Instructor Vic Mason (ag pilot), Chief Engineer Ken Weaver. 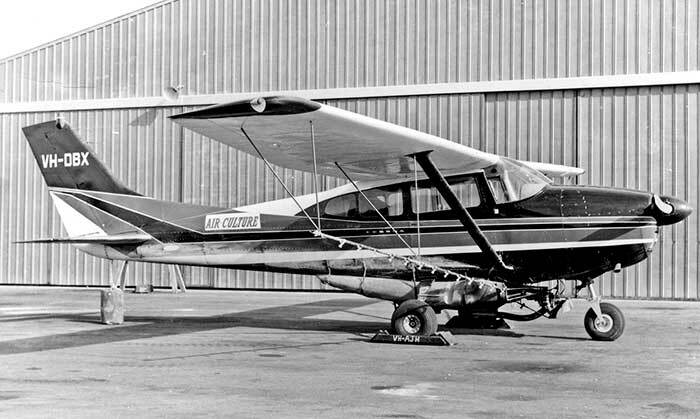 A new Cessna 172D VH-RYZ was purchased 11.63 and a Chipmunk and Tiger Moth were used. DCA inspection reports were critical from the start and in 10.64 Couper replied to a Departmental list of required improvements with the advice he would cease training operations immediately. The DCA file ends with the following memo: "I cannot foresee Mr.Couper ever being approved again for a flying school licence on the basis of reputation that has materialised over the years." 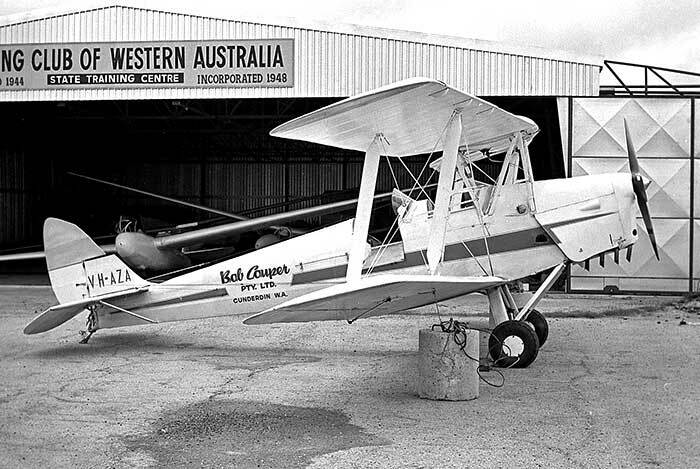 - In May 1963 Bob Couper & Co purchased 7 ag Tiger Moths and spare parts from Agricultural & General Aviation, Perth. All had expired CofAs or about to expire. 5 were ferried to Cunderdin where all were stored dimantled as spares. Bob Couper left to set up a new business at Wialki, taking Pawnees VH-MEQ & MER which he owned. Allan Fox continued as Manager of the reduced Cunderdin operation. DH.82 Tiger Moth VH-AMP 6.53. Leased 7.54 Scientific Spraying Service, Perth. Tfd 8.55 to Farmair, returned 6.56 to R.S.Couper. CofA expired 8.57. Stored dismantled Cunderdin. DH.82 Tiger Moth VH-AMG 4.57 CofA expired 6.60 Stored dismantled Cunderdin. 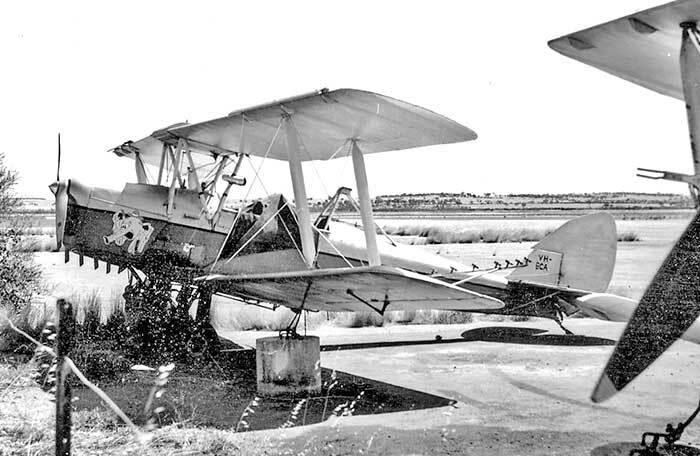 DH.82 VH-BGA sprayer with dumbo nose art, parked in a row of retired ag Tigers at Cunderdin January 1964. 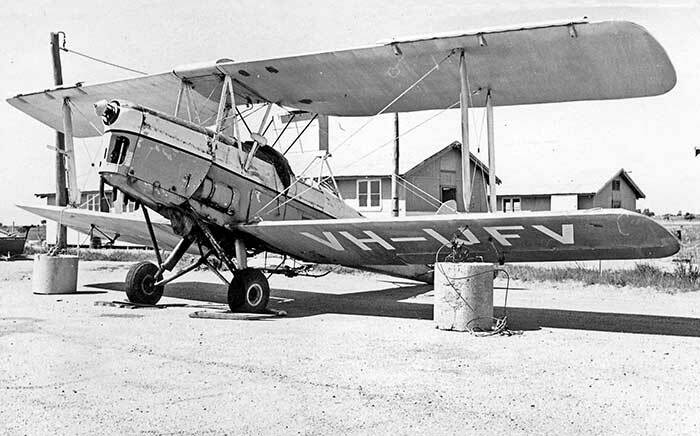 Another retired Bob Couper Tiger Moth VH-WFV was in poor condition at Cunderdin by September 1967. Nevertheless it was packed up by a Sydney dealer and shipped to USA to become N100MH. 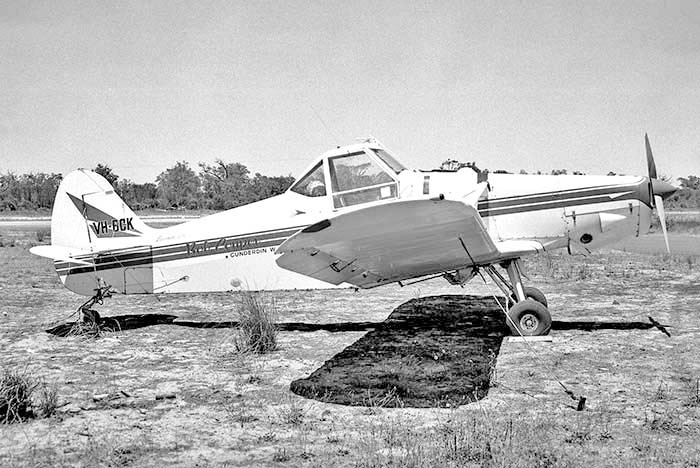 Sasin Aerostructures SA-29 Spraymaster VH-BCA at Cunderdin December 1969, while being used as a duster. In 1968 Bob Couper left Bob Couper Pty Ltd at Cunderdin and started a new operation from a farm near the small town of Wialki. The first seasons were operated as R.S.Couper, Wialki. 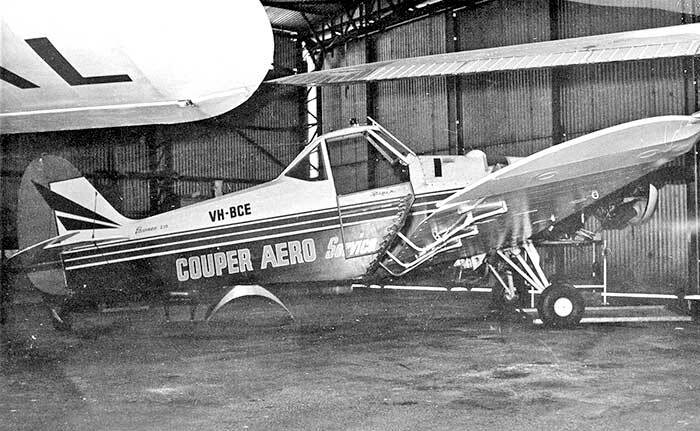 By 1974 a new company had been formed Couper Aero Pty Ltd, Perth, although it was referred to as Couper Aero Service. From 1978 he was operating as Bob Couper Agricultural, Perth. To blurr the paper trail, some of the aircraft were registered in the names of individual pilots c/- Bob Couper Agricultural with addresses at Donnybrook and Muckinbudin. 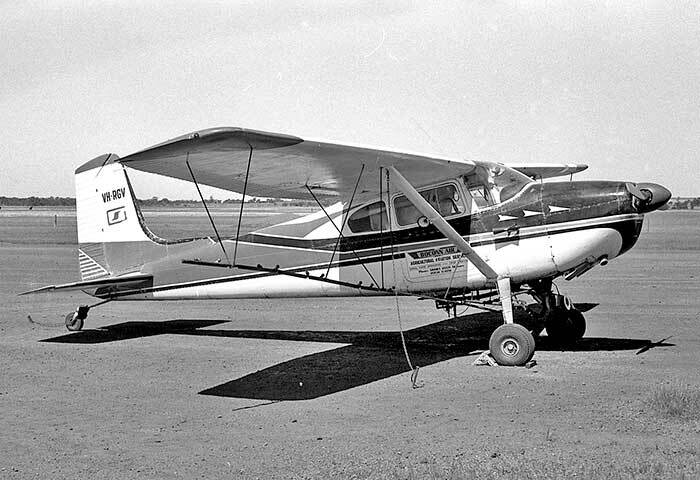 Cessna 180 VH-GCW was acquired for charter work, commencing October 1973 when Bob Couper flew it on supply runs to an expedition searching for the fabled Lassiters Gold in desert north of Leonora. Pawnee VH-BCE in the hangar at Cunderdin June 1968 freshly painted as Couper Aero Service. .Pawnee 150s VH-BTY & -MEQ in the same orange paint scheme at Mukinbudin in February 1975. Stanley Claude Doggett was an experienced pre-war Perth aircraft engineer who joined DCA as an Aircraft Inspector. In 1947 he left the Department to set up his own aircraft maintenance business at Maylands Aerodrome in partnership with wartime RAAF pilot Cyril Flood. 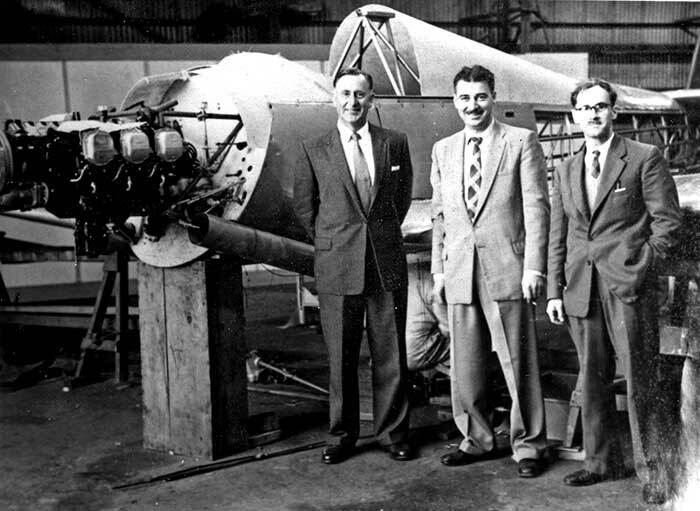 Their company Aero Service Pty Ltd became the main repair, modification and sales operation at Maylands, importing Austers and other light aircaft from England for WA buyers. 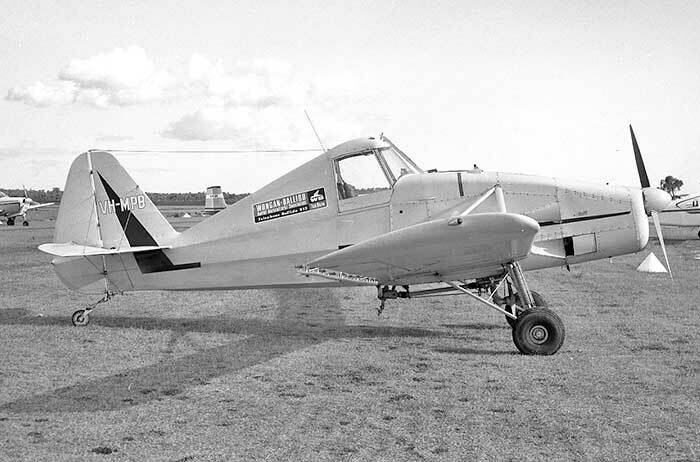 In 1952 Cyril Flood was keen to enter the growing field of aerial agriculture and the partners agreed to split with Flood building up Aero Service Pty Ltd as lan aerial ag operator, while Stan Doggett would set up a new business at Maylands to take over the aircraft maintence and charter work. Such was Stan's local reputation, he commenced his new operation named simply Stan Doggett. Ironically the majority of his early work was repairs and field CofA inspections of agricultural Tiger Moths. In October 1952 he purchased an Auster J5 VH-KBL for a contract with the Flying Doctor Service of Australia to provide pilots and aircraft fitted for a stretcher at their Meekatharra base. He kept this contract with Austers, a Proctor and a vintage Short Scion until 1958 when the flying doctor service began operating its own aircraft in WA. -During 1953 the business name was registered as Doggett Aviation and Engineering Co, Maylands Aerodrome. -Another Auster was acquired and Tiger Moths, for charter, aerial photography and joyrides, while the maintenance business was handling local aircraft up to Avro Anson size. -In June 1957 Doggett Aviation & Engineering Co applied for licences to commence crop spraying and dropping super phosphate using Tiger Moths. A contract was negotiated with Elders to apply their range of agricultural chemicals and this business relationship with Elders was maintained for the life of the company. Ag operations quickly grew and remaining charter aircraft were sold. 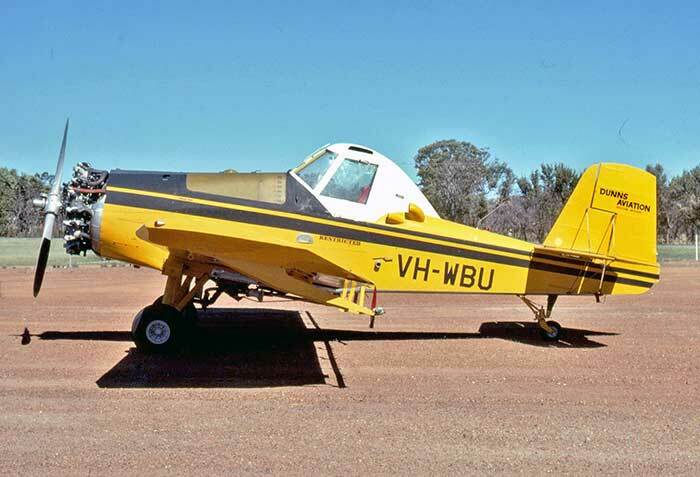 -During 1960 the company became Piper agents for WA as a result of their purchase of two new PA-25 Pawnees, the first seen in WA. This uneasy dealership arrangement continued for two years until the WA Piper agency was handed over to the newly-formed Millard O'Sullivan Aviation (MOSA) at Perth Airport. -During the late 1960s a slump in demand for aerial application services resulted in aircrraft fleet reduction and Stan Doggett introduced the manufacture of dinghy "tinnies" to keep maintenance staff engaged. By 1972 dinghy production was earning more profit than the ag business. 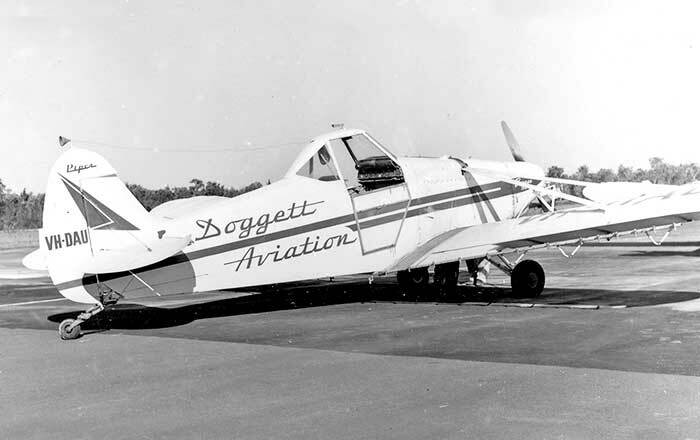 -9 June 1972 Doggett Aviation & Engineering Co Pty Ltd ceased operations and was wound up. Tiger sprayer VH-DAL has its hopper refilled with liquid agricuitural chemical at Maylands, Perth June 1959. Pawnee 150s VH-DAK & DAR at work spreading the superphosphate heap at Balingup in December 1960. 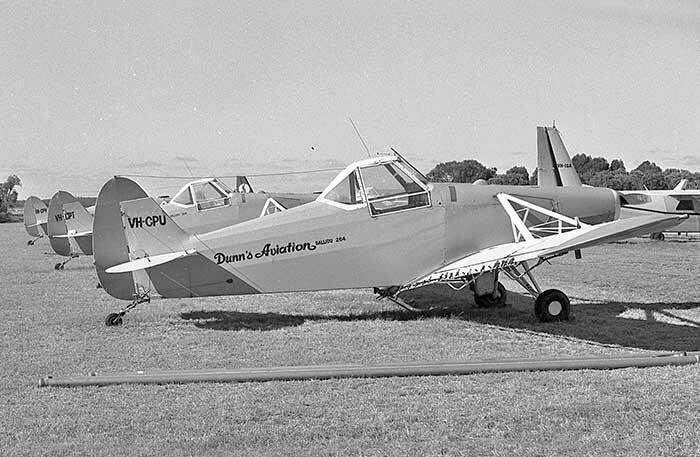 Pawnee 150 VH-DAR at a RAAF Pearce airshow in July 1963 when it flew an ag display. CA-28 Ceres VH-CEP on arrival Maylands 20 November 1961 on delivery from Fishermans Bend Vic. Edgar Percival EP-9 VH-DAI at Jandakot April 1965 shows the attractive Doggett paint scheme at that time. 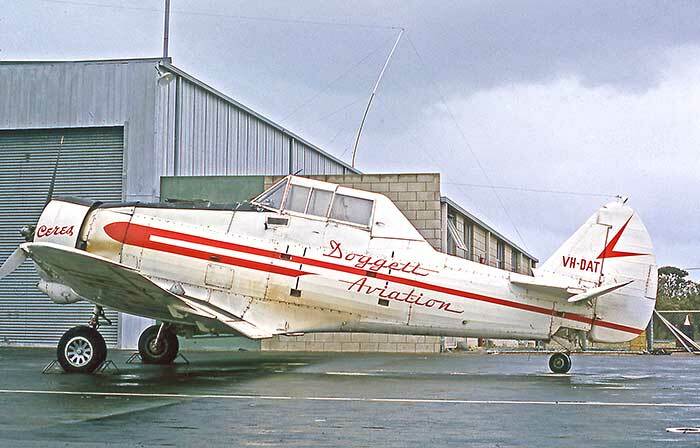 Beaver VH-IDD at Jandakot January 1967 with Doggett Aviation sticker while hired from Robby's, Adelaide. 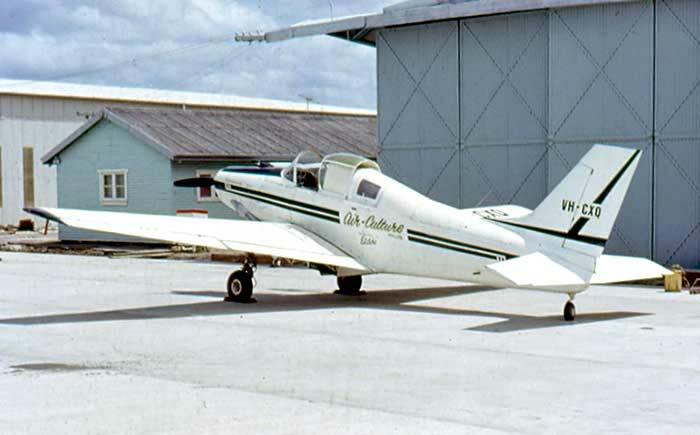 1960 model PA-25 Pawnee 150 VH-DAU at Jandakot in June 1965 repainted in Pawnee 235 scheme. Ian Leslie Dunn was born in 1928 and grew up on a farm at Rainbow Vic. With a strong interest in flying from an early age, he purchased his first aircraft at age 19 when he and boyhood friend Keith Crittenden each purchased a RAAF disposals DH.82 Tiger Moth offered at low prices "as is" without CofA by a Perth dealer. Carrying the 19 year olds as passengers, the Tiger Moths A17-134 & A17-690 departed Perth on 4 March 1947 on delivery to Victoria flown by Royal Aero Club of WA instructors. Dunn's A17-134 became VH-BBM. During 1954 Ian Dunn, now farming at Grassdale Vic acquired Ryan STM VH-AGV, and Percival Proctor VH-BEG. In 1961, by now farming at Merino Vic, he purchased Miles Gemini VH-BDC. 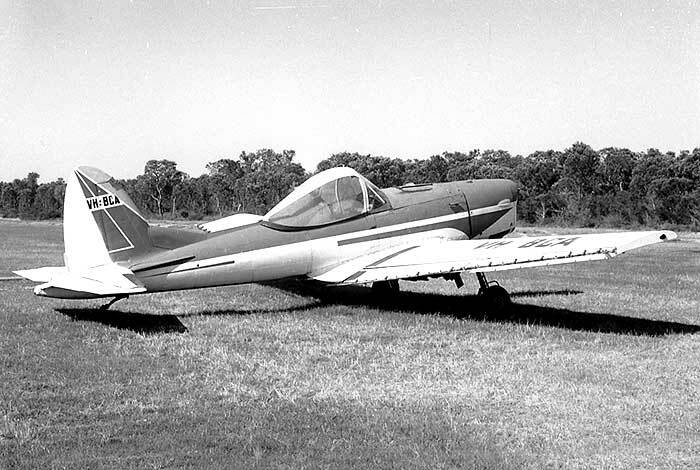 Later in 1961 Dunn moved to Mount Barker in southern WA and flew the Gemini to its new home. He ran a contracting business from 52 Osbourne Street, Mount Barker, later moving to 10 Humphries Street, Albany WA where he worked for Simpson Bulldozing Co. His Gemini VH-BDC was written off in a forced landing due engine failure on takeoff from Albany on 21 June 1962 but Dunn was unhurt. He was without an aircraft until March 1965 when he acquired a Tiger Moth VH-CKE. He also had a farm at Green Range, near Albany with a 3,000 feet airstrip. 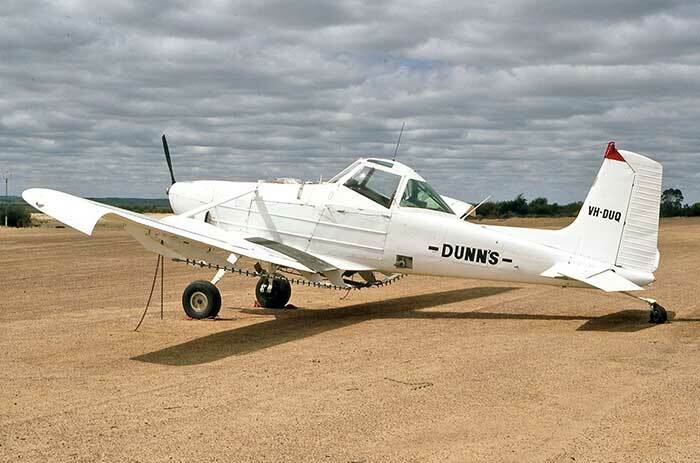 In 1965 Dunn was a Callair A9A pilot/salesman for the Ballidu branch of Western Aerial Services, Cunderdin. 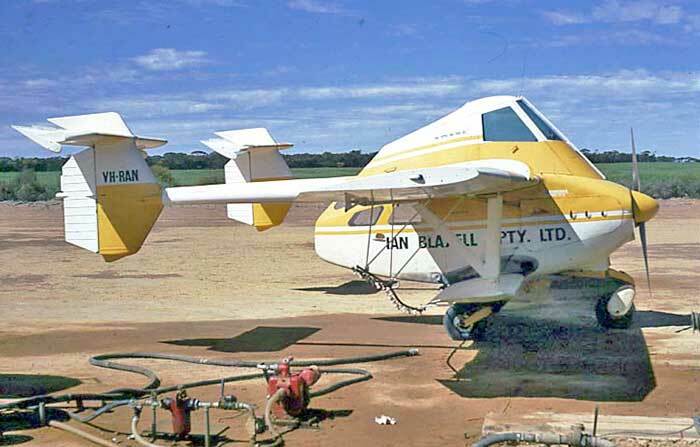 In early 1967 Dunn went out on his own, registering I.L.& B.Dunn as an aerial agriculture business based at Ballidu and Albany with a Callair A9A VH-MPB acquired from Robbys Aerial Services, Adelaide. The operation was named Wongan Ballidu Aviation. More Callairs were to follow. Support aircraft were Tiger Moth VH-DYI and PA-24 Comanche 250 VH-COZ from February 1969. 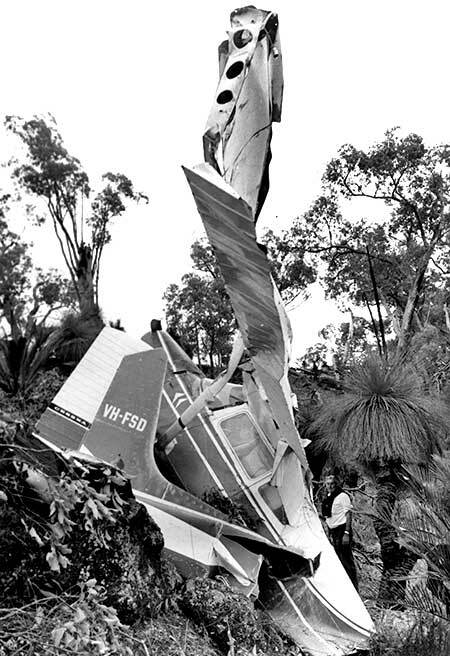 The Comanche was wrecked 10 February 1972 when Ian Dunn made a forced landing between Green Range and Albany on 10 February 1972. 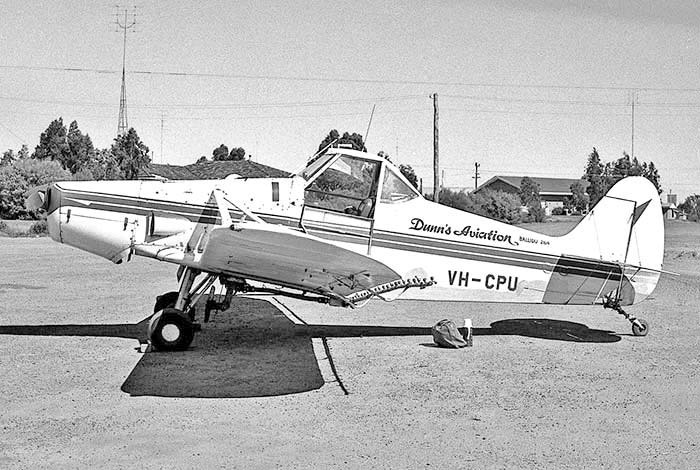 The DCA Airwork Licence was initally issued to Ian L. & Beryl Dunn, later Wongan-Ballidu Aviation, P.O.Box 75 Ballidu and changed in 1974 to I.L.Dunn t/a Dunn's Aviation, Box 117 Ballidu. Early pilots included T.Allen, J.Harris, Neal Williams and Ian's son P.J.Dunn who took over management at Ballidu. 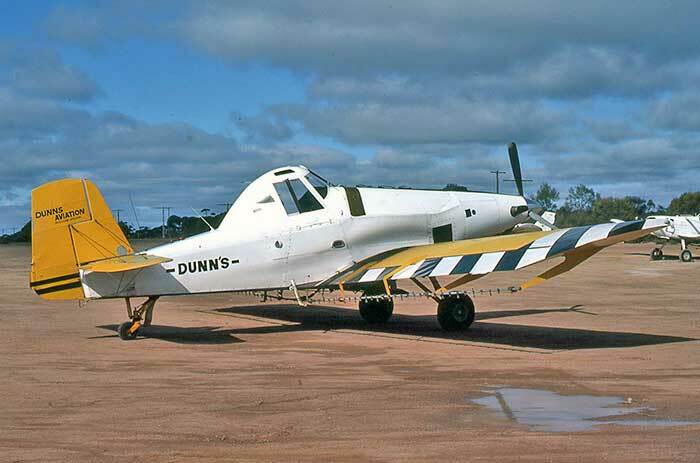 - Dunair Services conducted various airwork operations, such as Beech Baron VH-KXK fitted with silver iodide burners in 1978 for a rainmaking project. 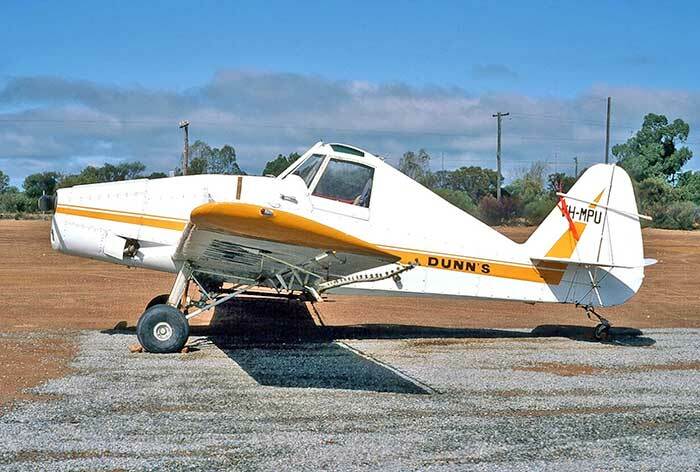 Dunn's Aviation was the first WA aerial ag operator to introduce turbine equipment in March 1981 with an Ayers S-2R-T34 Turbo Thrush VH-DUN. Ian Dunn retired to Geraldton, where he died peacefully on 17 February 2017. Today the company is known as Dunn Aviation, Ballidu managed by Neville Dunn. 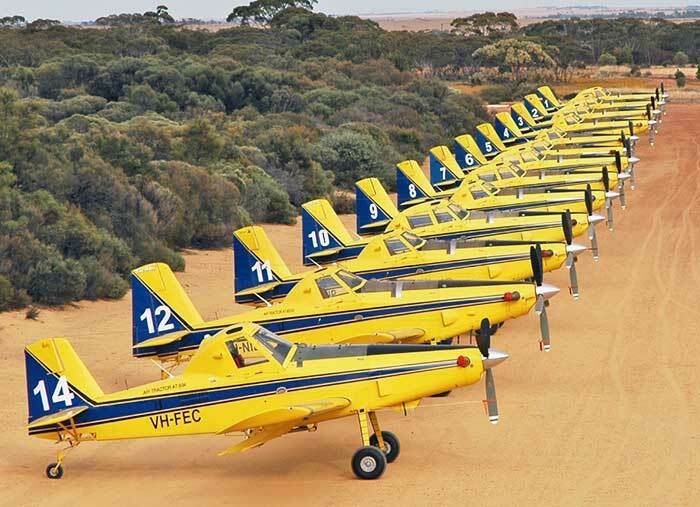 With a fleet of AT-802 Turbine Air Tractors, it is the largest aerial agricultural operator in WA. It provides fire-fighting, pest and disease control, baiting, fertilizing, seeding, oil slick pollution control, mine site dust suppression and re-vegetation..
A fleet of turbine Air Tractor AT-504s and AT-802s were added to the fleet since the years covered in this summary. 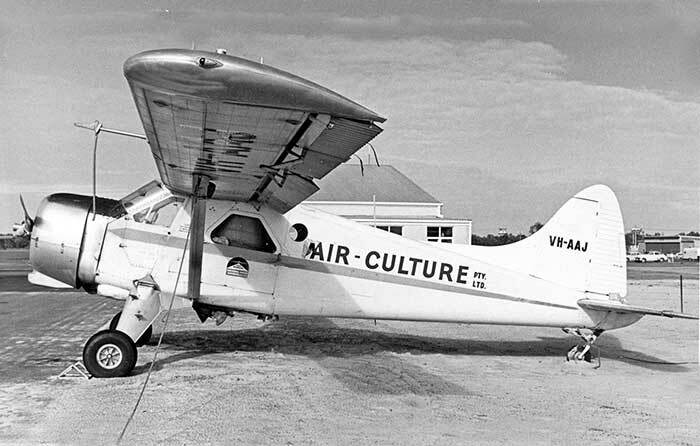 Ian Dunn's first Callair A9A VH-MPB with Wongan-Ballidu Aviation sticker, at Jandakot July 1968. 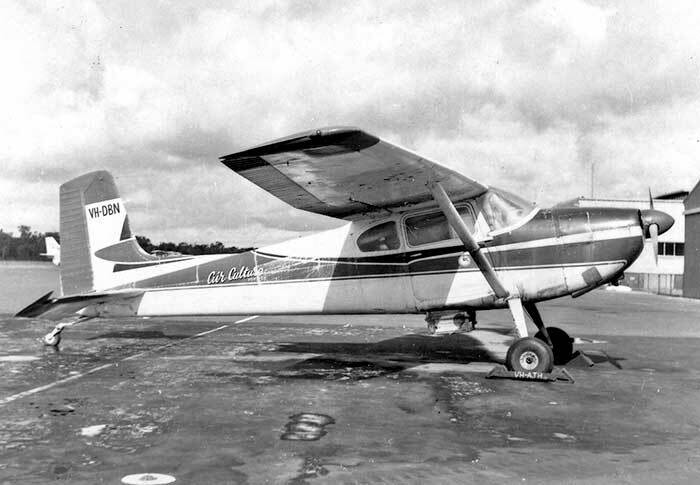 First aircraft was Cessna Agwagon VH-KQA purchased new in July 1968 from Jandakot Cessna dealer Simpson Aviation. It was flown by veteran WA ag pilot Max Taylor. It was wrecked in a forced landing near York due fuel exhaustion in August 1970. 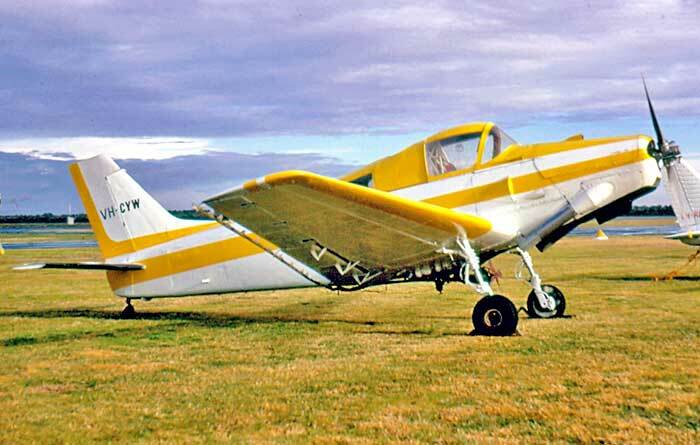 Fortuitously only a month earlier Yeoman Cropmaster 250 VH-CYW had been acquired in the sale of assets when Air Culture ceased operations at Jandakot. 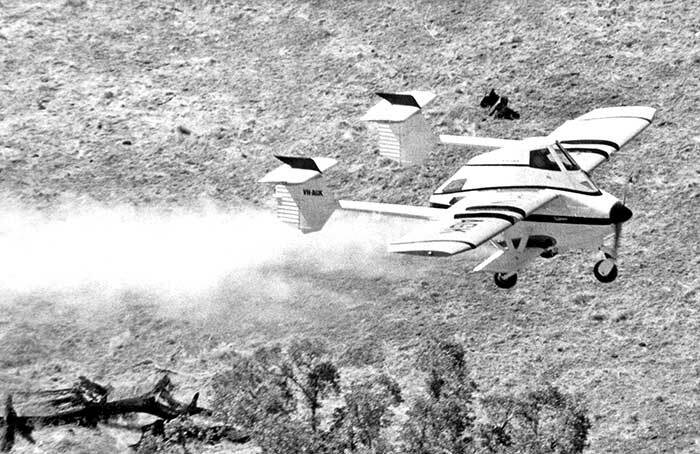 The Cropmaster conducted extensive spraying in the Chittering-Bindoon area during March-May 1971. In April 1972 the business was reorganised as Falcon Super Spread Pty Ltd, 150 Semple Road, Jandakot with Chief Pilot George T. Wells, an experienced ag pilot from NZ. The operating base was Moonyoonooka near Geraldton. 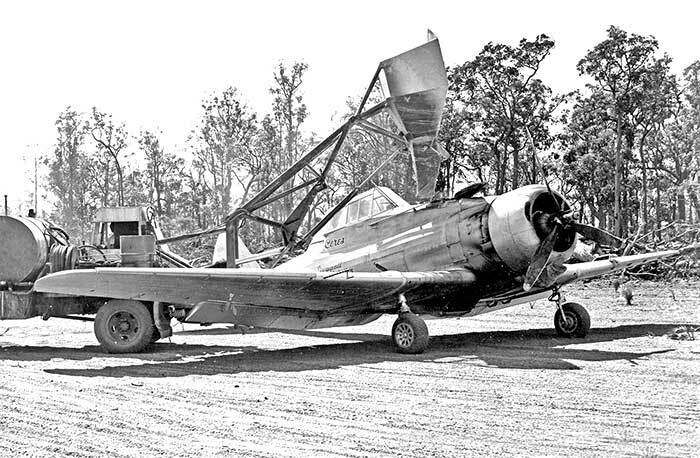 The Agwagon VH-KQA wreck, which had been stored at Jandakot, was rebuilt during 1972 by Bernies Aviation, Jandakot and damaged airframe sections were replaced and donated to the Airport Fire Service for training. KQA returned to service in November 1972, only to be damaged in a ground-loop landing Moonyoonooka on 19 January 1973. 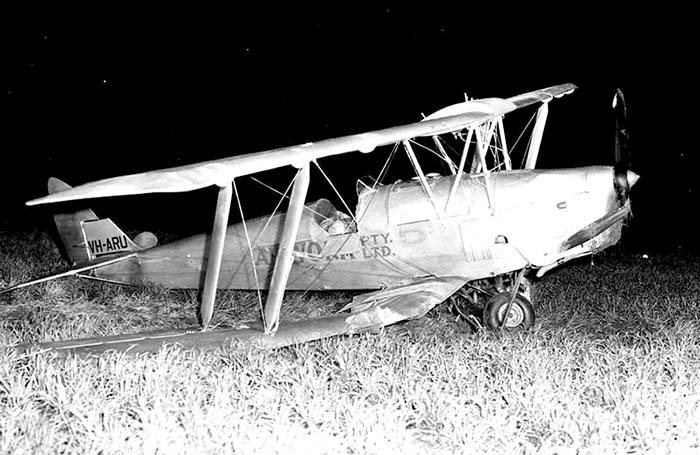 It was repaired and sold, replaced by a later model A188A VH-RIK. The Yeoman Cropmaster was sold through Jandakot sales agent Brian Hooey on 9 April 1973 to Ian Dunn, Ballidu. At the time the Yeoman was undergoing an extended overhaul at Bernies Aviation, Jandakot and was on-sold prior to completion to Ian Chambers. In 1974 George Wells purchased the Steins' investment in Falcon Super Spread and by 1977 was operating as George Wells Aviation. Formed in 1955 as a partnership between Robert S.Couper, Albany and James F. Pekin, Perth. 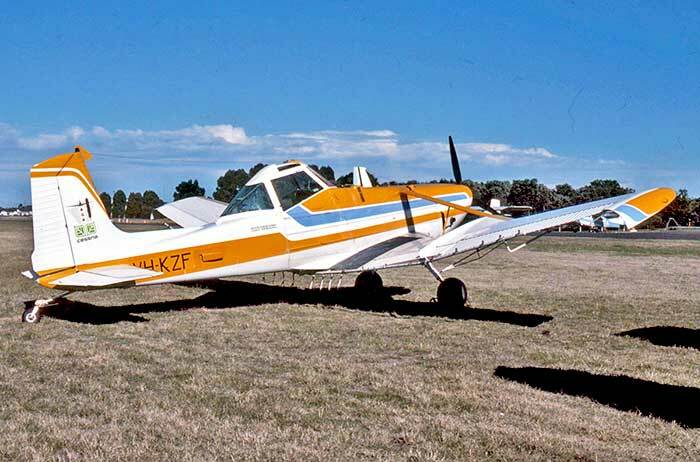 Bob Couper was a pioneer WA ag operator at Albany and Jim Pekin was an experienced local pilot who had flown ag Tigers for other operators while managing his charter and maintenance business Air Activities Pty Ltd at Maylands Aerodrome, Perth. Ownership of Bob Couper's Tiger Moths VH-AHP & -AMP was changed to Farmair Pty Ltd on 1 September 1955 and DCA Airwork Licence issued 31 October 1955 to Farmair Pty Ltd, 9 Hobbs Avenue, Como, Perth. Agricultural spraying operations commenced throughout the WA wheatbelt with these two Tiger Moths. 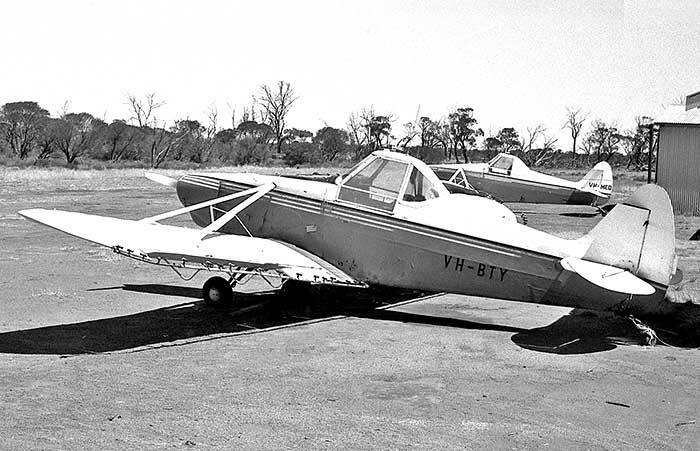 In June 1956 the partnership was dissolved, Couper retaining VH-AMP and returning to Albany to conduct ag work under his own Airwork Licence (see Bob Couper Pty Ltd above). 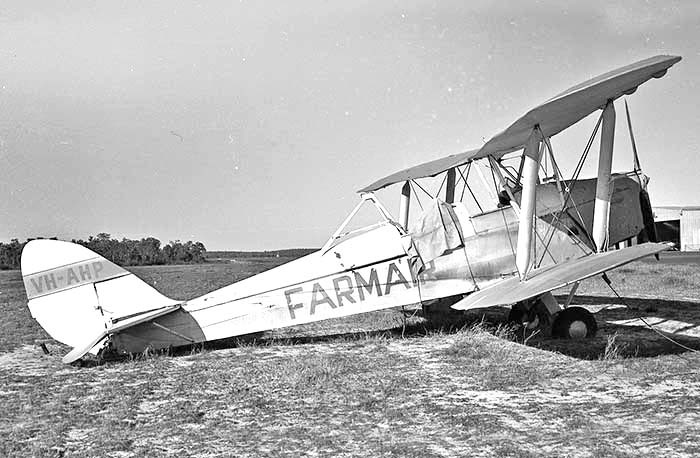 Farmair continued with Jim Pekin as Managing Director and Chief Pilot. The company address changed to 189 Railway arade, Maylands. He purchased two more Tiger Moths already converted for ag work, but neither purchase went smoothly. The first in 1958 was from Airspread, Melbourne. The Tiger was ferried to Maylands where on arrival it was found to be in extremely poor condition. Pekin stopped his payment, resulting in a court case which he won - the unidentified Tiger Moth was returned to Melbourne. The following year he purchased VH-BVZ from an unconnected Sydney company also named Farmair. 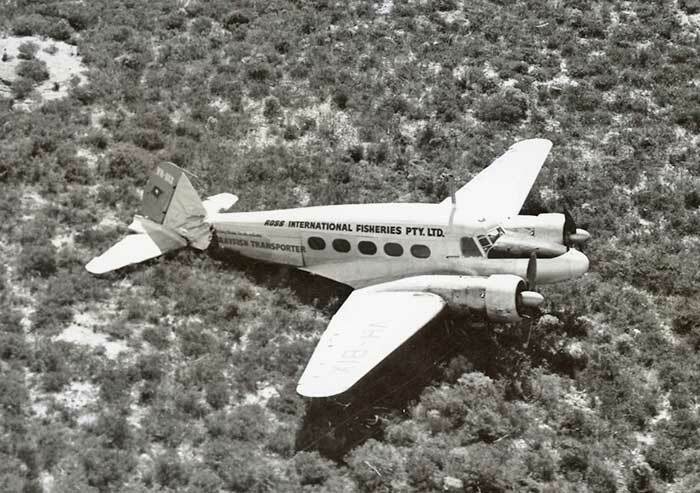 During its long delivery flight from Bankstown to Perth in 20 August 1959 it overturned on landing at a refuelling stop on the Nullabor Plain, 13 miles from the Reid railway siding. Jim Pekin flew out from Perth and sent the ferry pilot back to Sydney on the next Trans Continental train, while Pekin dismantled the badly damaged aircraft and loaded it on a rail wagon for Perth. Its rebuild at Maylands was not completed until June 1960 when test flown by John Bell. 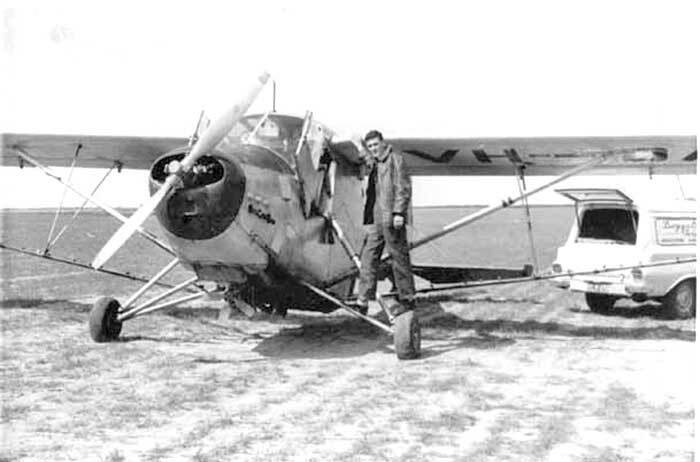 He had been engaged by Pekin in early 1958 after flying with a Victorian ag operator. John Bell flew VH-AHP all 1958 season and stayed with Farmair until 1961 when he left to to fly Cessna floatplanes on spotting work for Cheynes Beach Whaling Company, Albany. Farmair remained a modest two Tiger operation, by 1963 VH-AHP & -BVZ were both painted in the same paint scheme of silver with blue, yellow and white and a large FARMAIR on the fuselage. 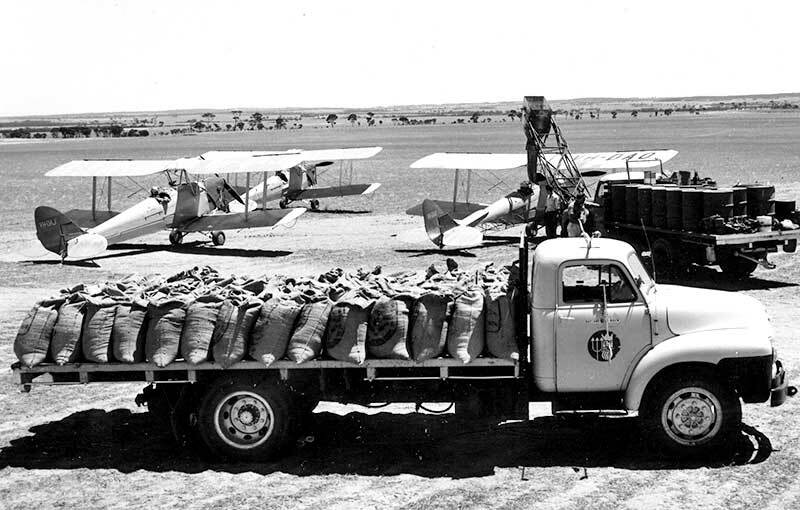 The DCA grounding order for agricultural DH.82s requirement that operators reduce their DH.82 fleet each year was neatly solved when VH-BVZ wa wrecked landing in a metre high lupin crop near Dalwallinu in September 1963. 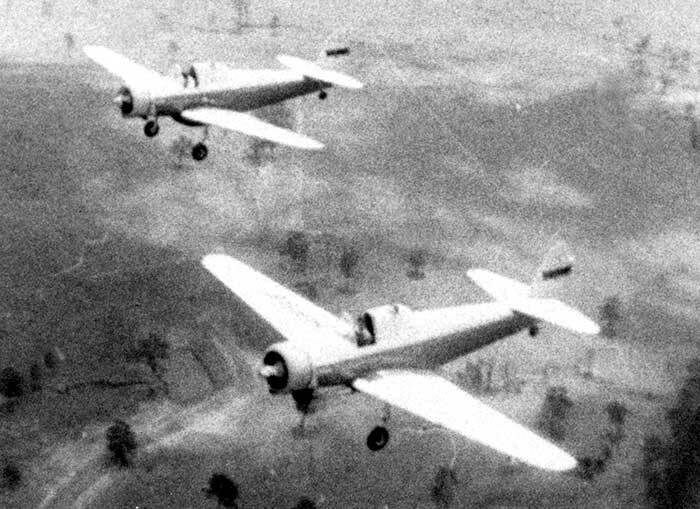 Pawnee 235s were introduced and operations were based on a farm 12 miles east of Pithara, with hangar, underground fuel tanks, pumps etc. Jim Pekin carried out the maintenance and a pilot was hired for each season. Farmair had ceased operations by 1984 when its last Pawnee was sold. 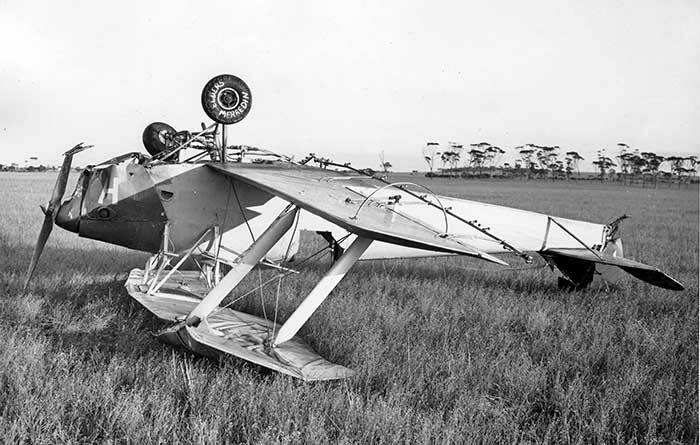 DH.82 VH-BVZ 8.59 ex Farmair, Sydney Overturned 20.8.59 Reid on delivery, rebuilt Maylands, test flown 20.6.60. 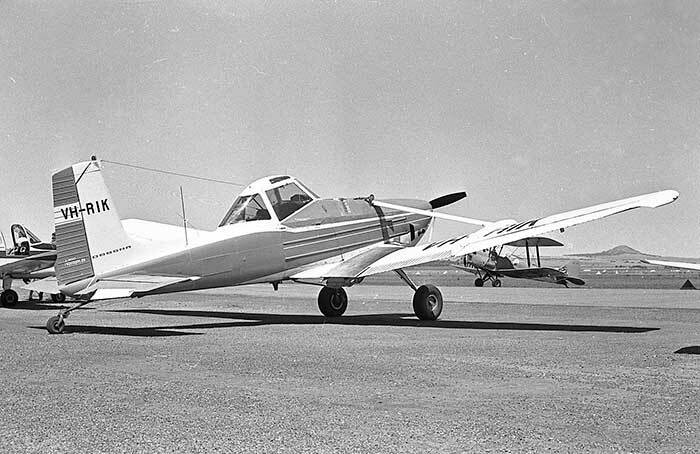 - VH-AZT purchased 2.60 from Royal Queensland Aero Club and ferried to Perth from Brisbane by Forrest 2.60; test flown by him at Maylands 2.5.60 after conversion to ag sprayer. 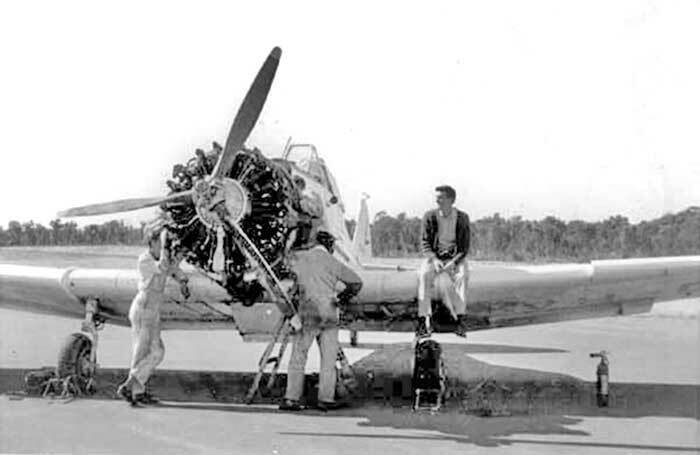 Although based on the town airfield at Carnamah, maintenance was carried out at Maylands Aerodrome until it closed 30.6.63, when the company's Carnamah hangar was approved as a workshop for aircraft maintenance. 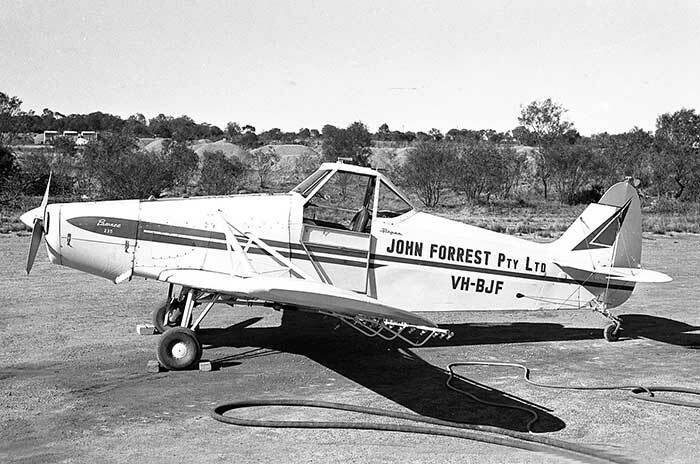 John Forrest Pty Ltd placed the first Australian order for the new PA-25 Pawnee 235 model, receiving VH-BJF in October 1962. A second Pawnee 235 was purchased in 1965 in the name of a business partnership formed with Coorow farmer Miles Y. Morcombe, Morcombe and Forrest Pty Ltd. John and Miles were long-time friends. 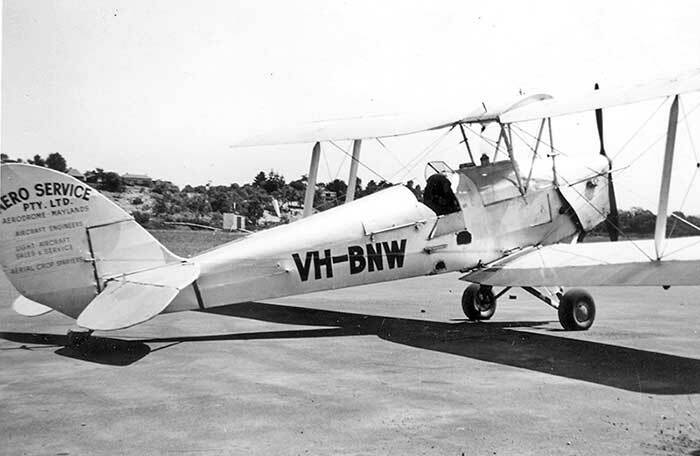 Back in October 1960 John had purchased and ferried another Royal Queensland Aero Club Tiger Moth VHAZA from Brisbane to WA on delivery to Miles Morcombe. 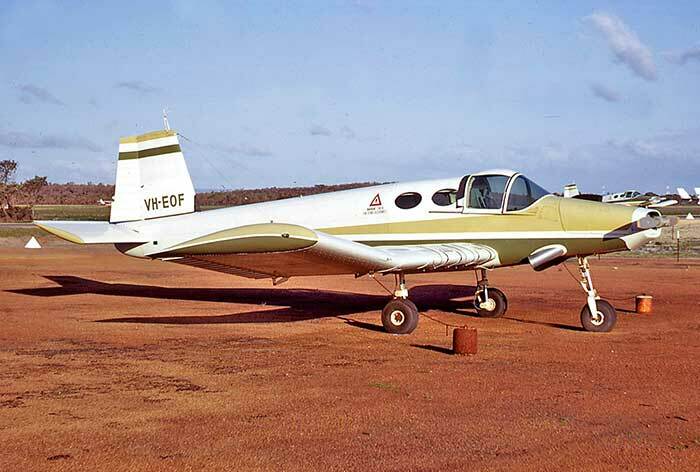 Their new Pawnee 235 VH-BMF was operated from Carnamah and Morcombe's property at Waddi Forrest. 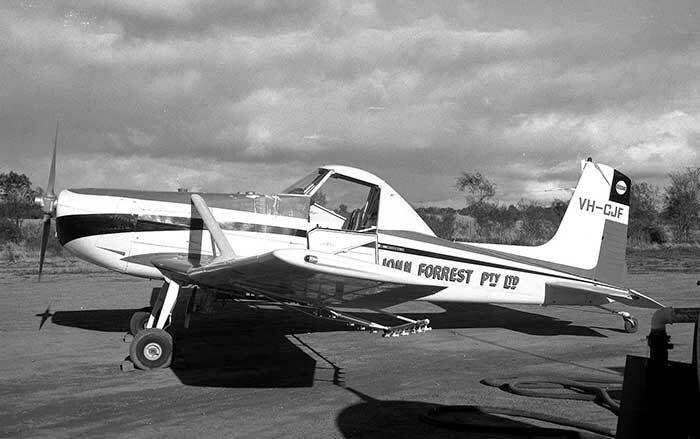 As John Forrest Pty Ltd increased its business, accommodation units were built on Carnamah airfield for pilots hired each season, mostly from New Zealand. DH.82 VH-BTP 10.59 conv. to sprayer 4.60 Named Heckle Wrecked 20.7.62 Carnamah blown over by wind storm DH.82 VH-AZT 2.60 conv. to sprayer 5.60 Named Jeckle Retired ag flying 8.64, conv. to two seater. Sold 1973. A DCA clerical slip allowed VH-DJF's registration to be reallocated in 1978, so the Pawnee became VH-IJF. Founded in 1948 at Parafield Aerodrome, Adelaide by former RAAF wartime pilot Eric T. Furness. He was an instructor with the Royal Aero Club of SA at Parafield when he saw the need for an additional aircraft maintenance business on the aerodrome and the chance to introduce aerial agriculture in South Australia. He already owned Tiger Moth VH-BBD, which he purchase as A17-592 from postwar disposal sales in December 1946 for £220. Furness Aviation Service commenced with aircraft maintenance supervised by senior engineer Harry Price. DCA files record that the Department's inspectors were impressed by the company's workmanship and high standards. Two Tiger Moths were modified for insecticide spraying by the company, and gained work in SA mostly in the South East farming area. 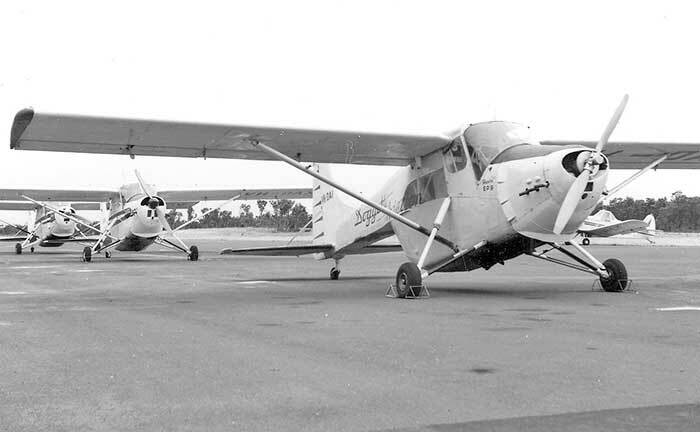 During 1950 FAS applied to DCA for an airline licence to operate two Ansons on a network of routes between Adelaide and Pinaroo, Naracoote, Port Augusta and Yorketown under the name Furness Airways Ltd. DCA would not grant a licence because most ports did not have licenced aerodromes and the cost of aerodrome upgrades was the responsibility of the operator. On 22 July 1951 Furness Aviation Service wrote to the West Australian Transport Commission requesting approval to commence aerial agricultural operations in WA from September 1951. Spraying and dusting would be carried out in the South West area of the State, using Tiger Moths VH-BBD & VH-FAS. It is not known whether this work did take place, but in July 1952 the company wrote that it did not wish to renew the WA state licence. 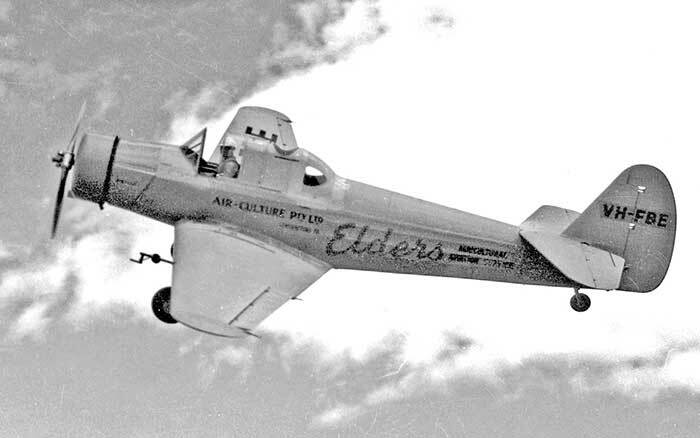 In 1952 Eric Furness joined ANA as an airline pilot and left Furness Aviation Service with engineer Harry Price. 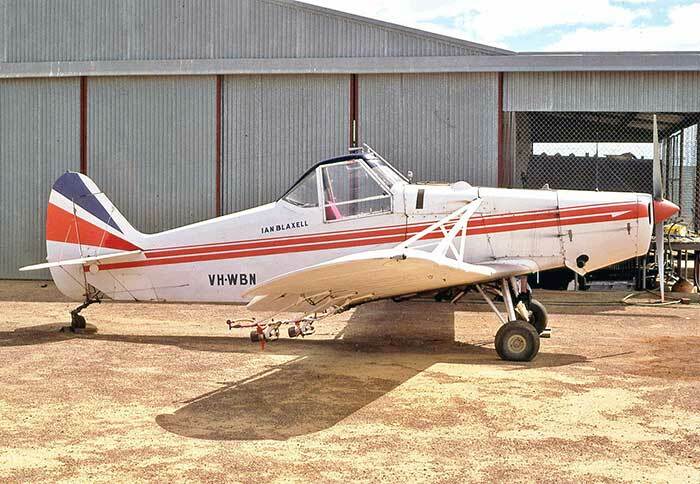 The company was restructured as Aviation Services (SA) Ltd a maintenance and aircraft sales business, while the aerial agricultural organisation was taken over by a new company Rural Aviation, Parafield.